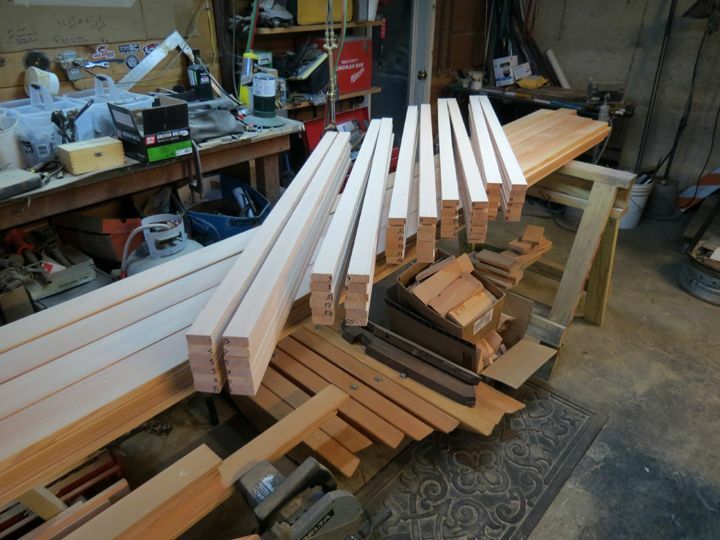 With the new frames back in my shop, I laid out where I wanted the new fastenings to be. 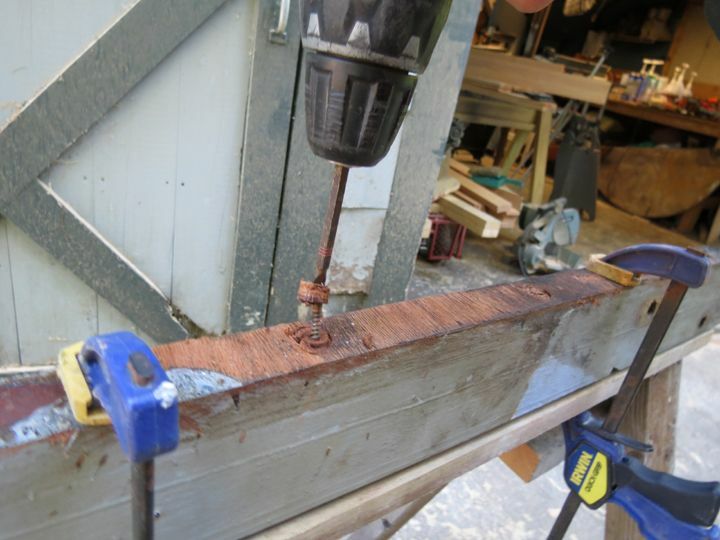 The old frames had one screw through the frame head and into the chine log. 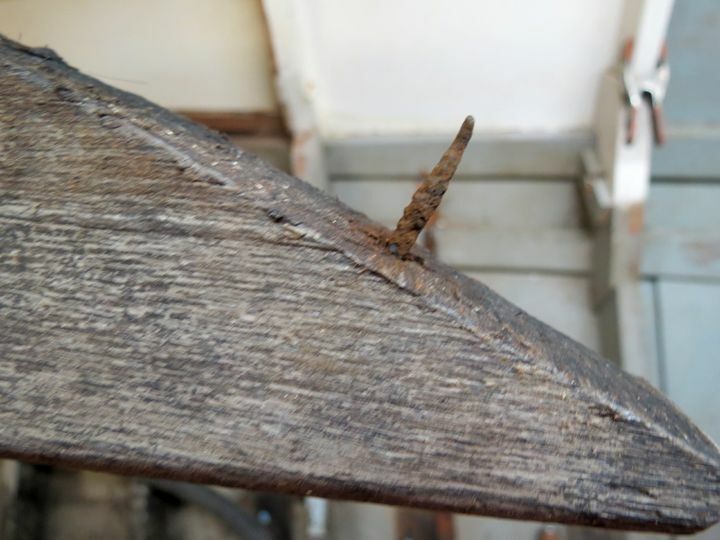 There was also one screw that fastened the foot of the frame to the keelson. 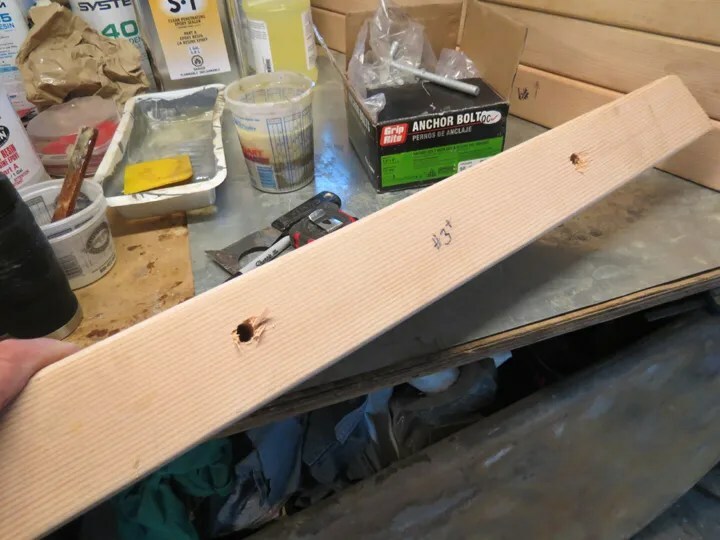 There were just two screws that fastened the frame to the floor timber. 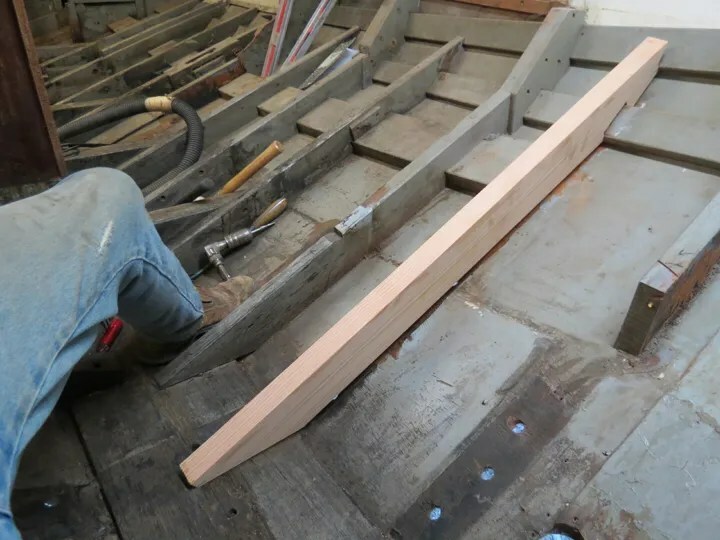 And, there were the screws that fastened the frame to the skin of the hull. 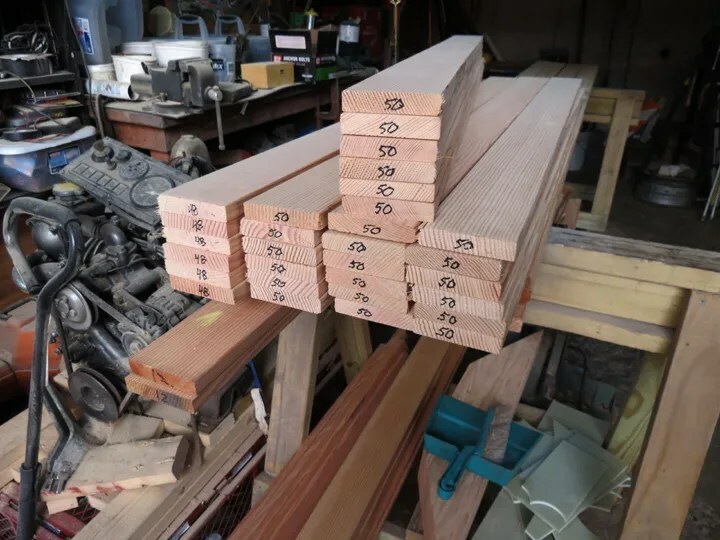 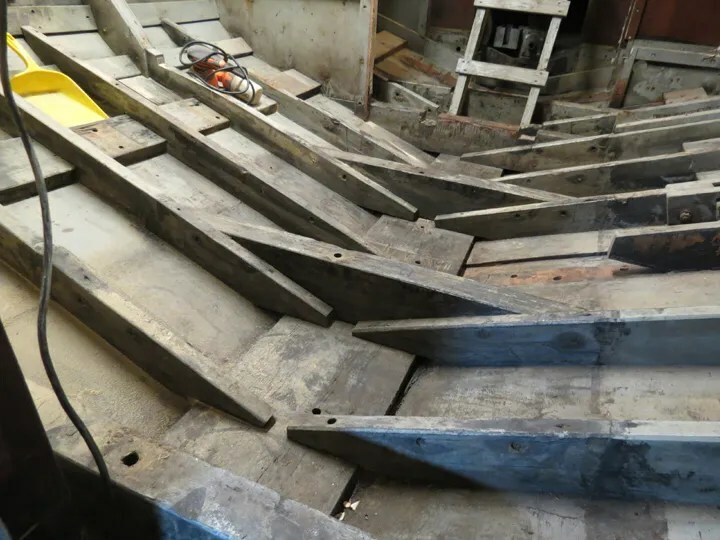 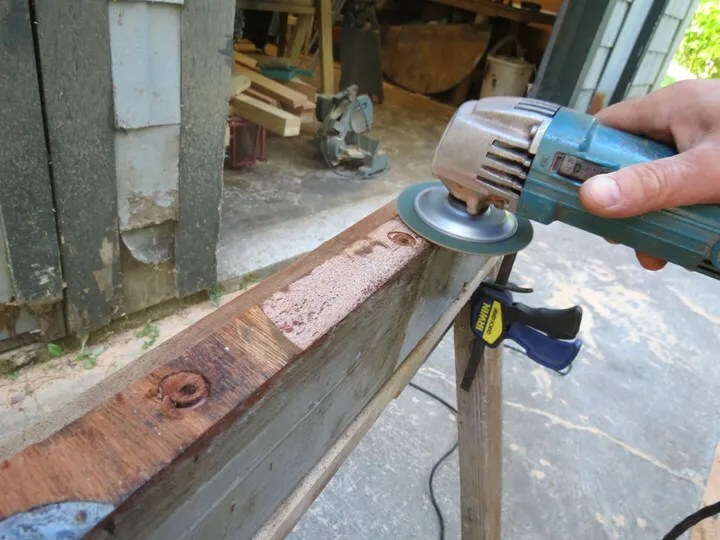 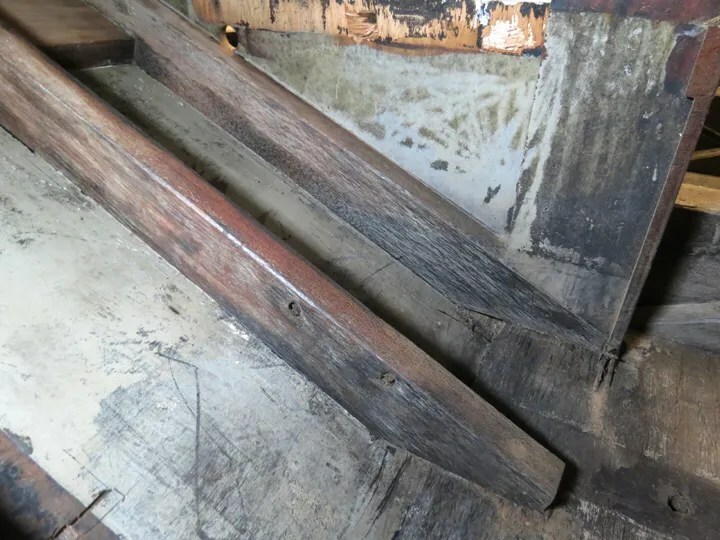 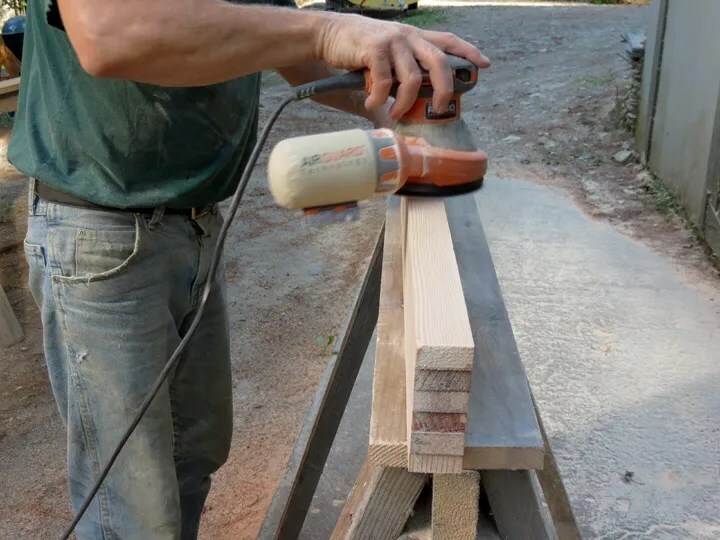 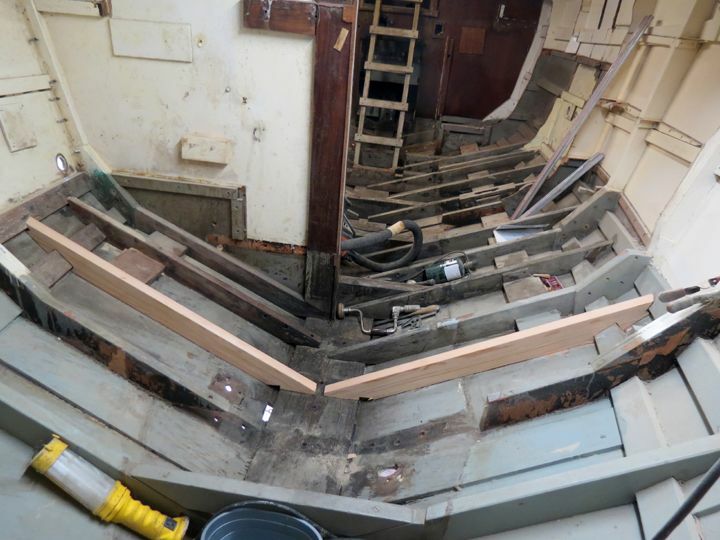 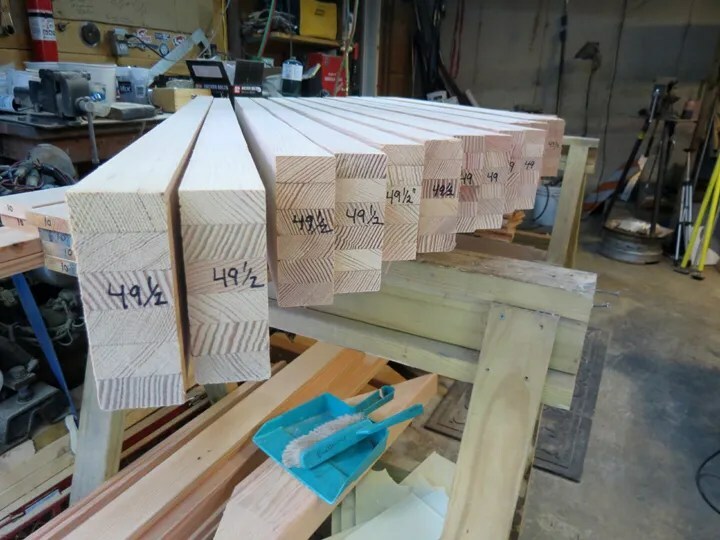 Along with these fasteners, there was also the use of resorcinol glue between the frame and the hull skin, chine log, keelson, and between the face of the frame and the face of the floor timber. 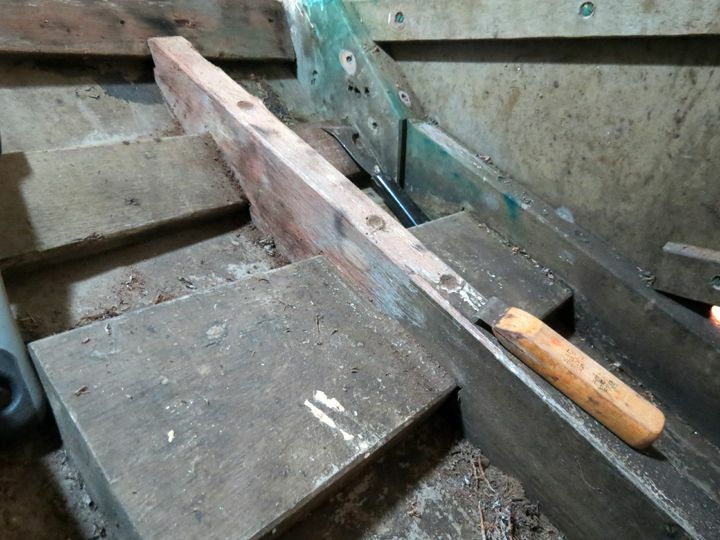 The glue joint between the floor timber and frame had failed. 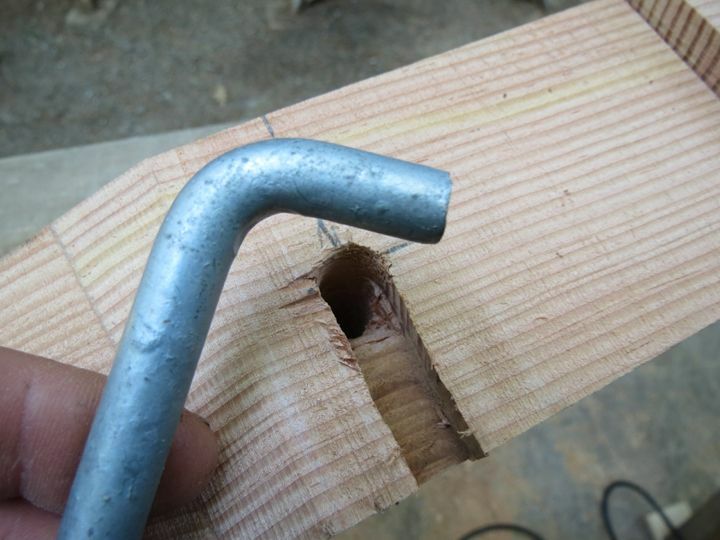 It had also failed between the keelson and the foot of the frame. The fastenings in these areas had also failed; rotting away. 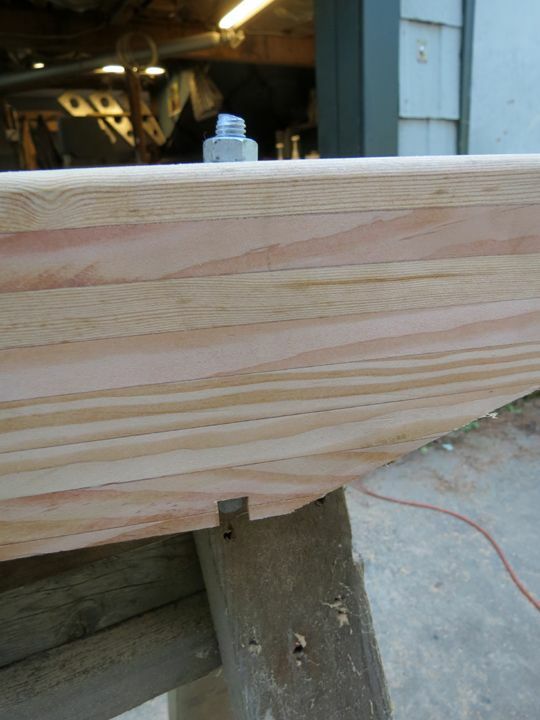 I decided that I wanted to really “beef up” the weak areas that were present in the original design of the boat. 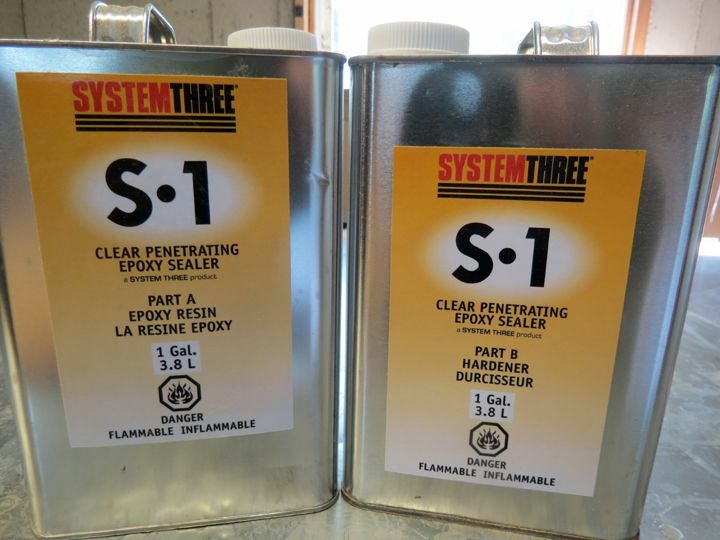 Below is the system that I came up with. 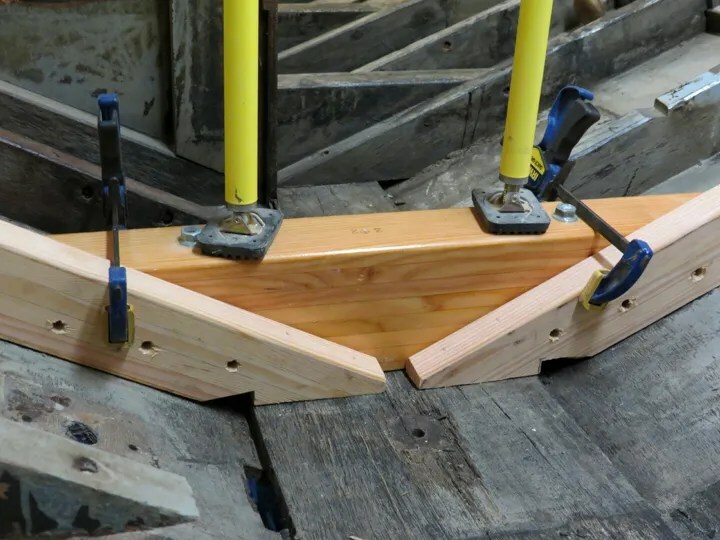 I drilled three 3/8″ diameter holes through the face of each frame in the foot area. 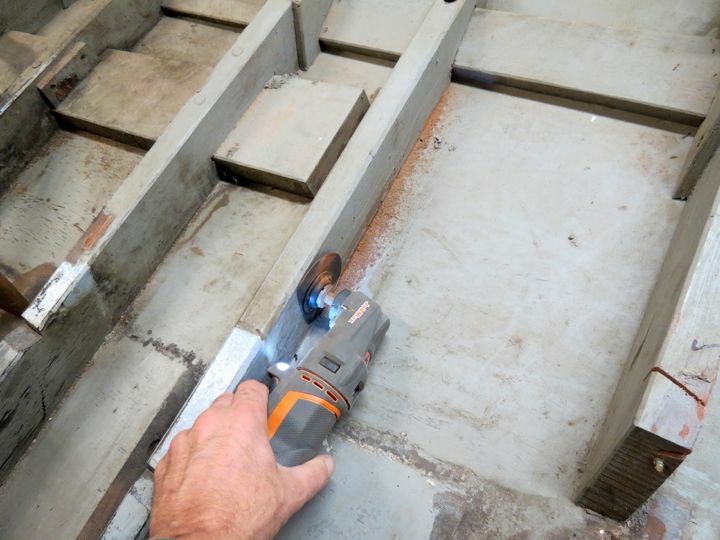 These holes will allow three 3/8″ diameter galvanized bolts to pass through the frame and through the floor timber. 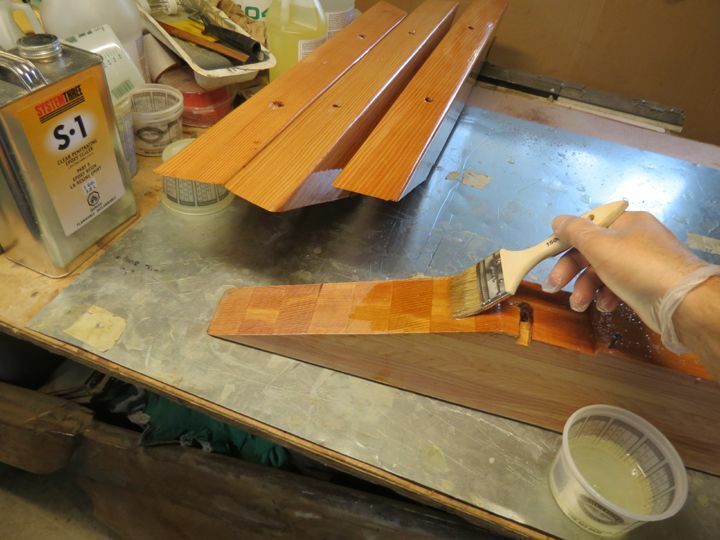 The mating surfaces of the frame and floor timber will also be glued together with epoxy. 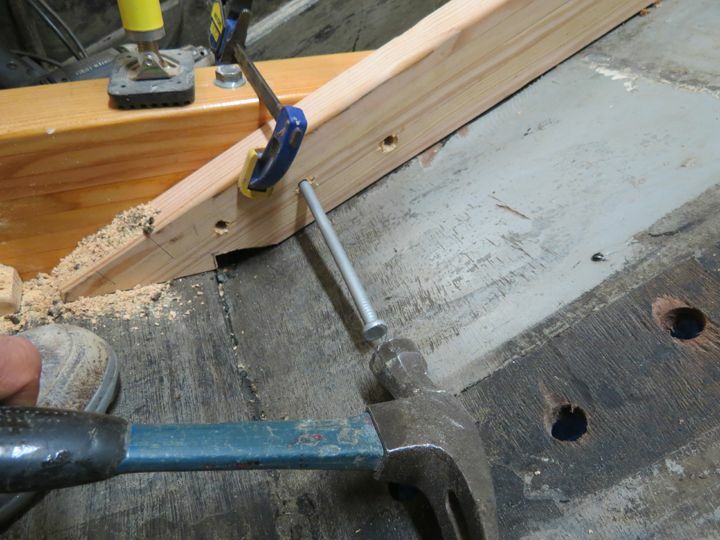 Positioning the frames against the floor timber so that I can mark the corresponding holes of the frames on to the face of the floor timber. 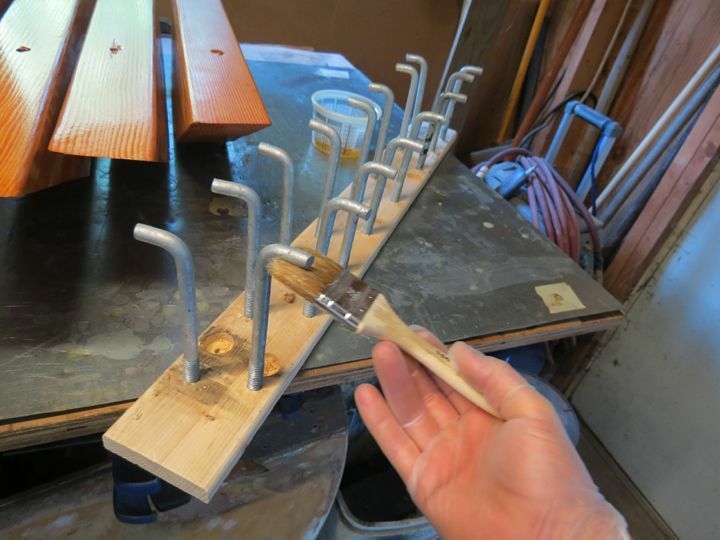 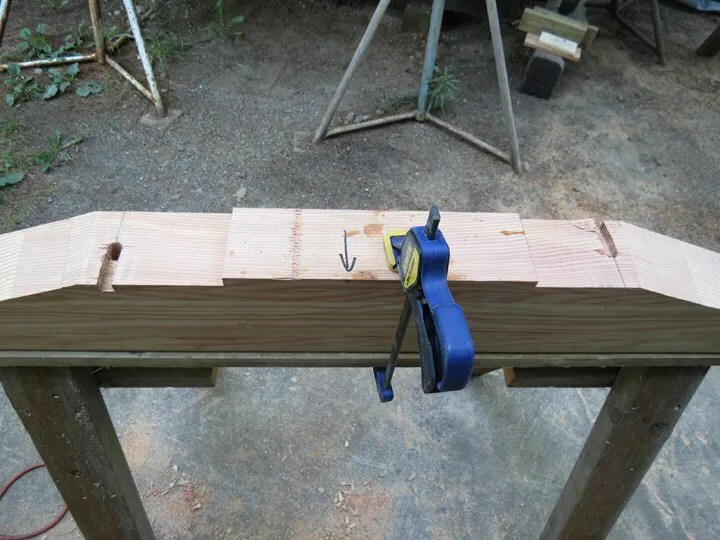 With everything clamped firmly in place, I drilled a 3/8″ diameter clearance hole through the head of the frame. 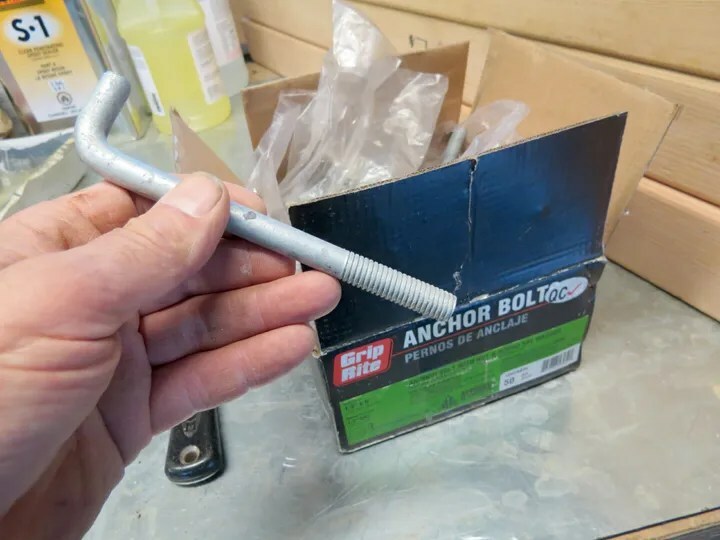 This will allow for a 3″ long, 3/8″diameter, galvanized lag bolt that will be much stronger than just the original countersunk screw! 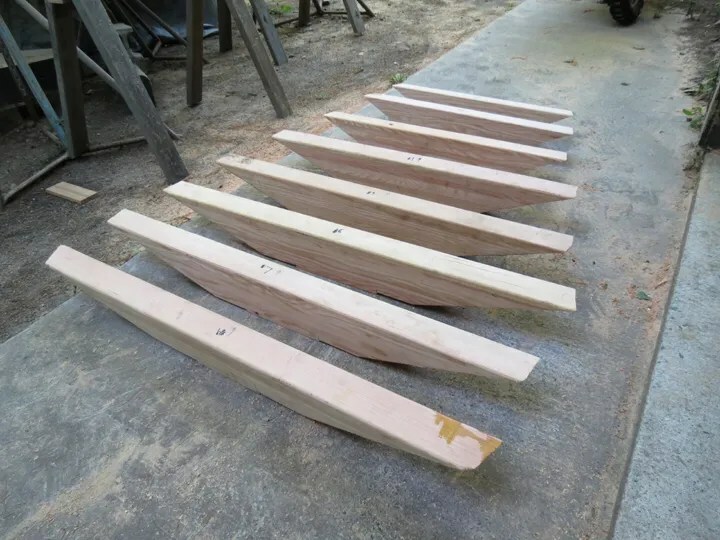 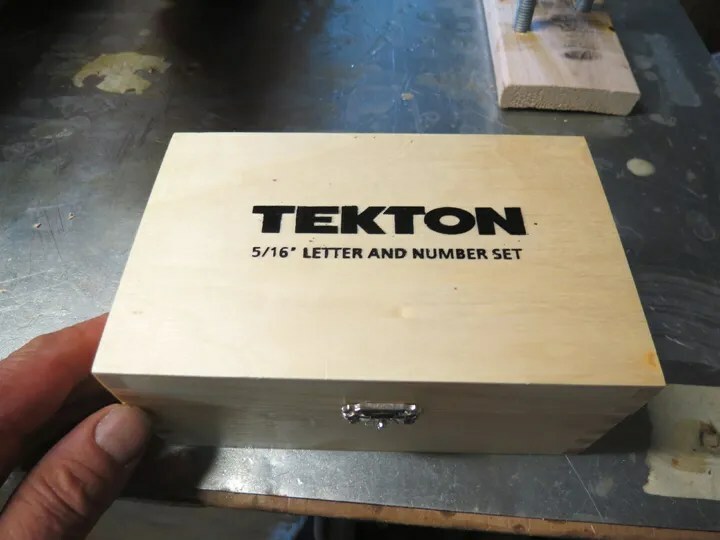 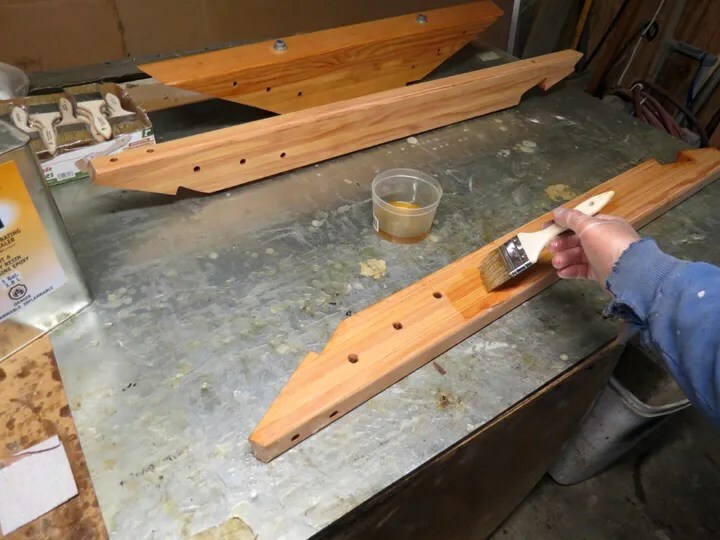 In similar fashion, I will be adding two 3/8″ diameter lag bolts through the foot of each frame that will bite into the keelson. 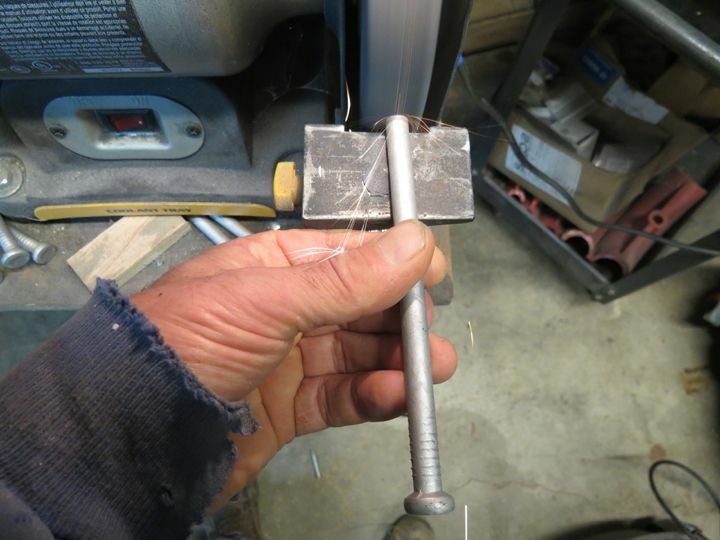 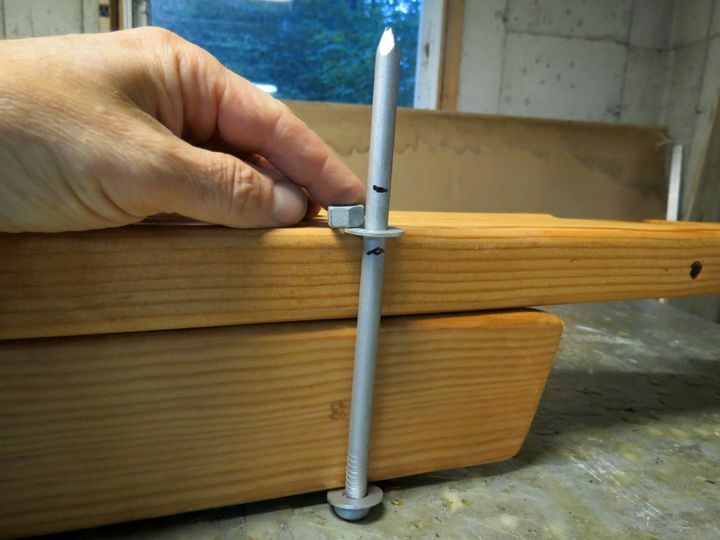 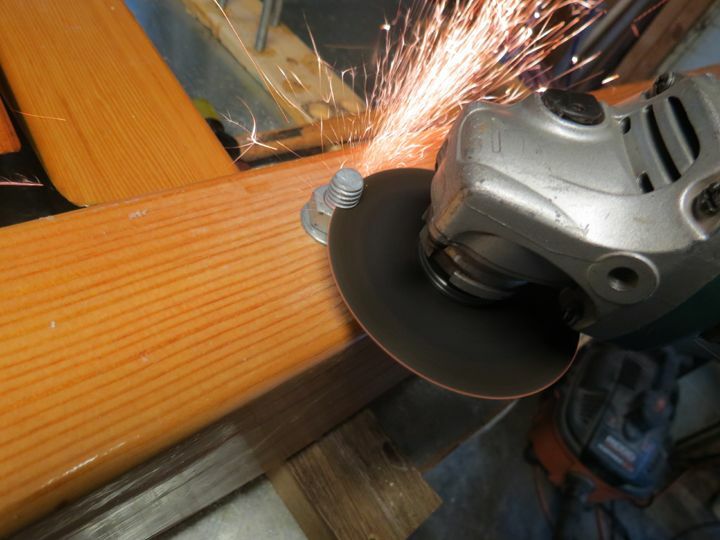 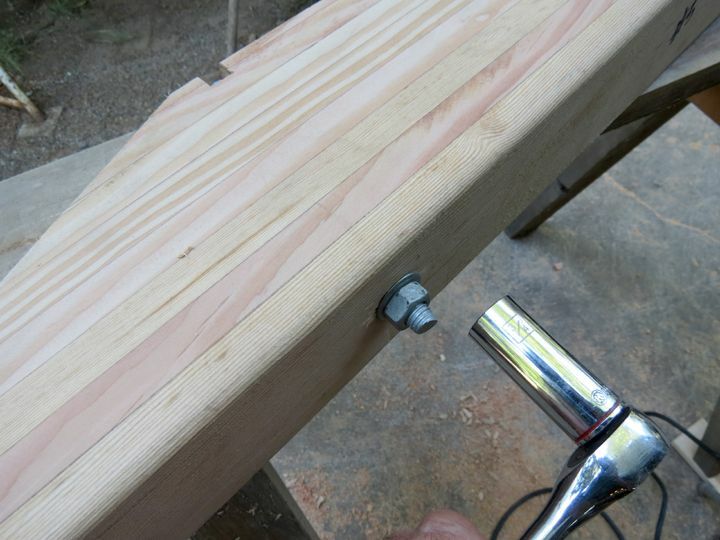 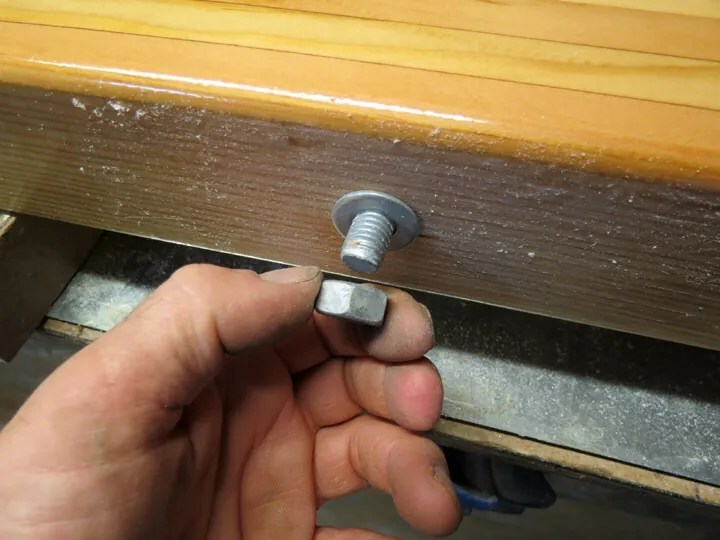 To fasten the frame to the floor timber, I decided to make my own 3/8″ diameter bolts. 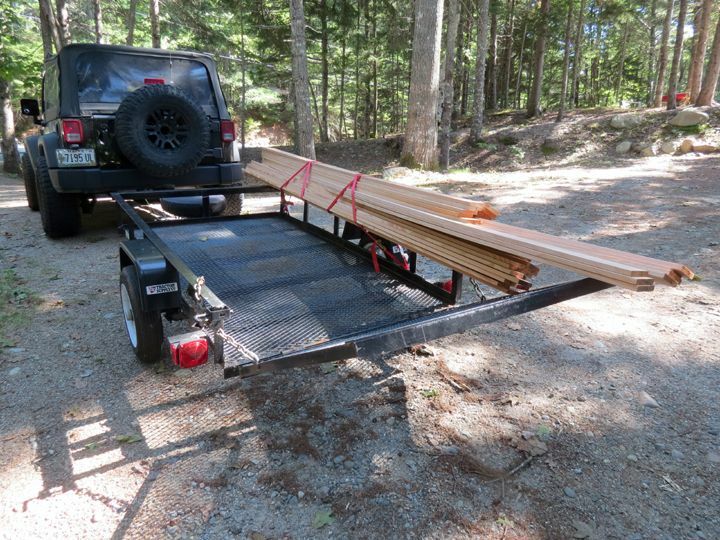 The simple reason for this is; expense. 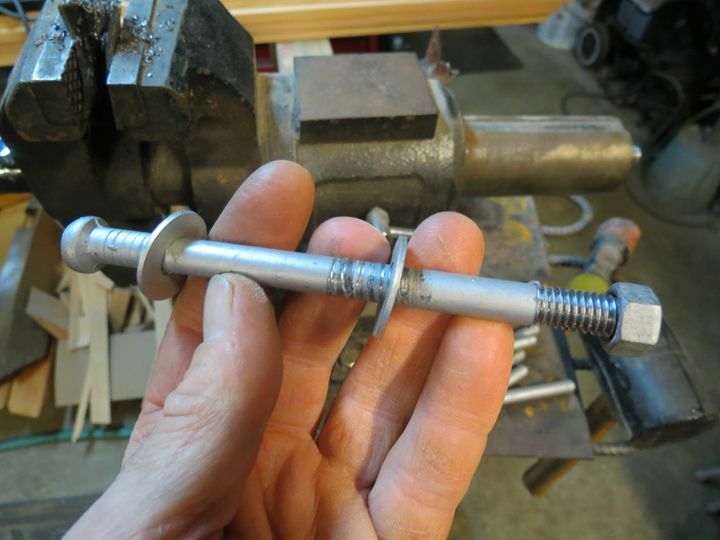 By threading the ends of some 3/8″ galvanized spikes, I save 50% of what it would cost to purchase actual bolts. Besides, I really didn’t like the fact that the bolts that I had access to were threaded their entire length. 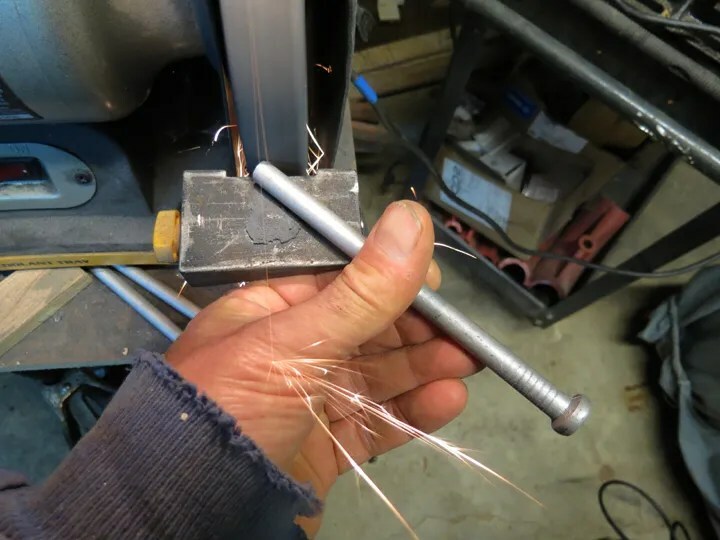 I just wanted threads where I needed them to be; right at the end. 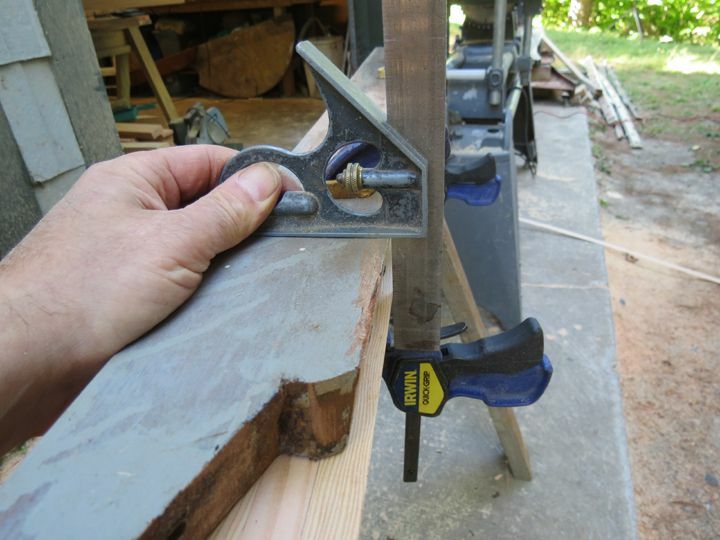 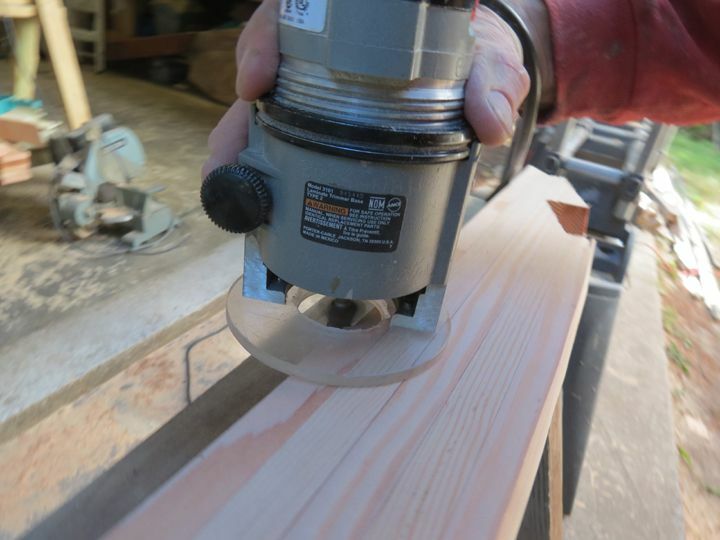 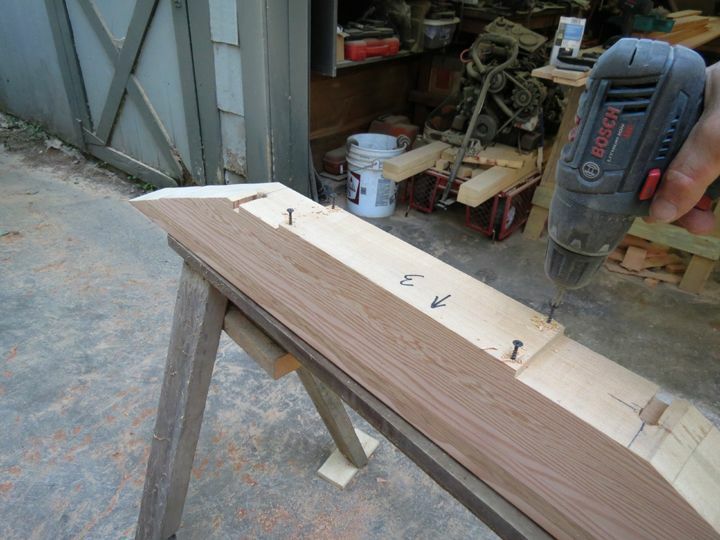 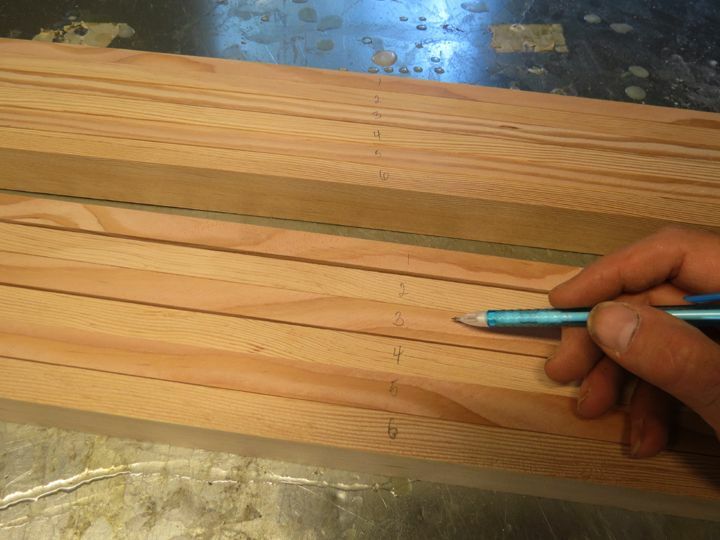 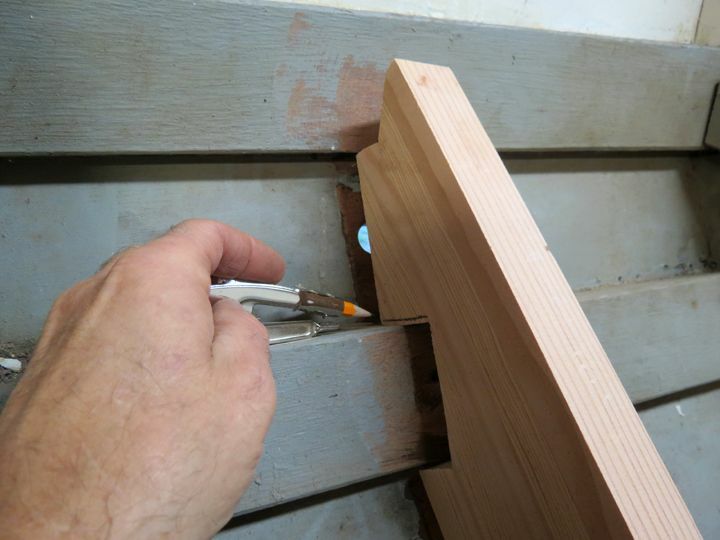 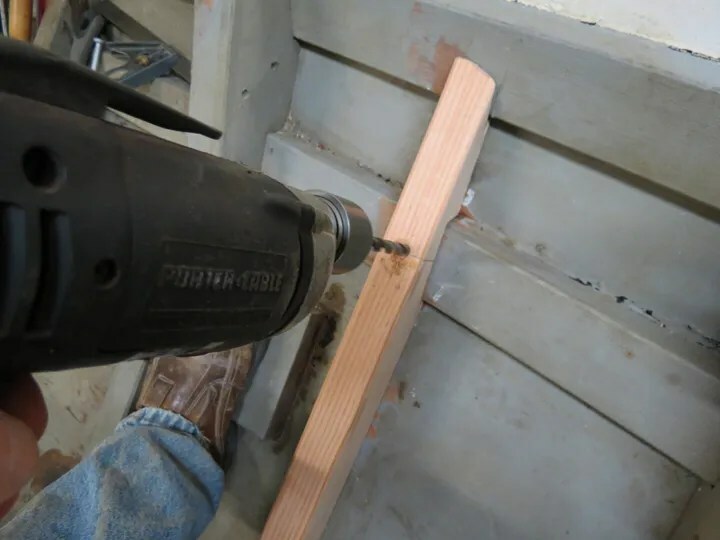 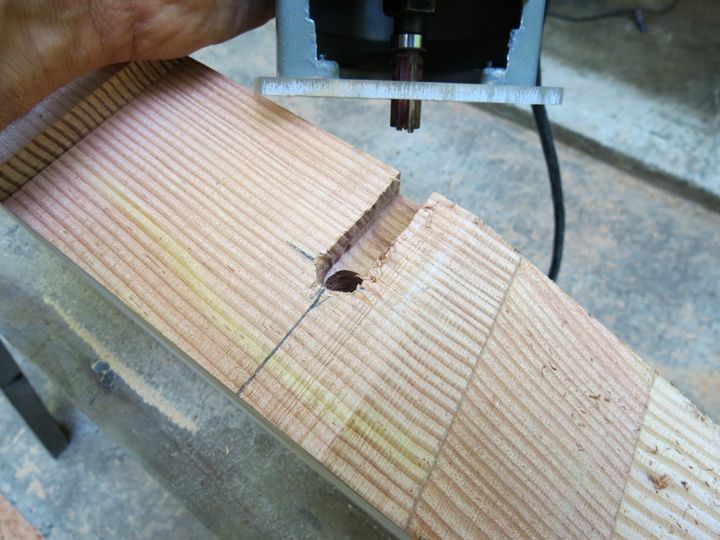 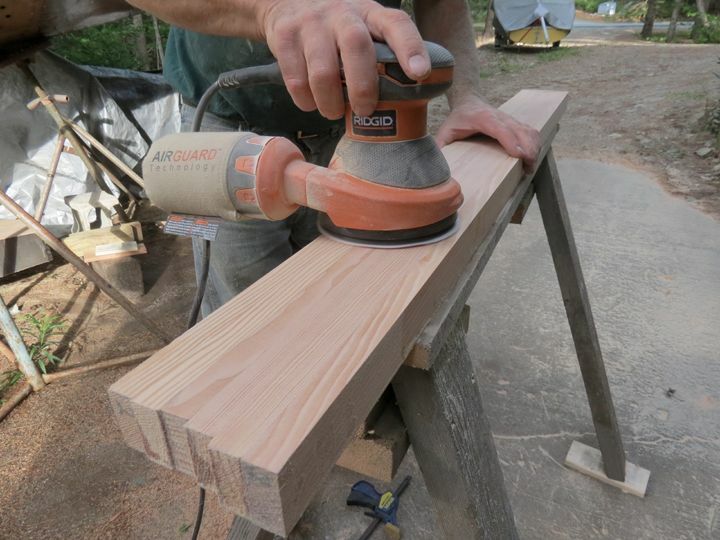 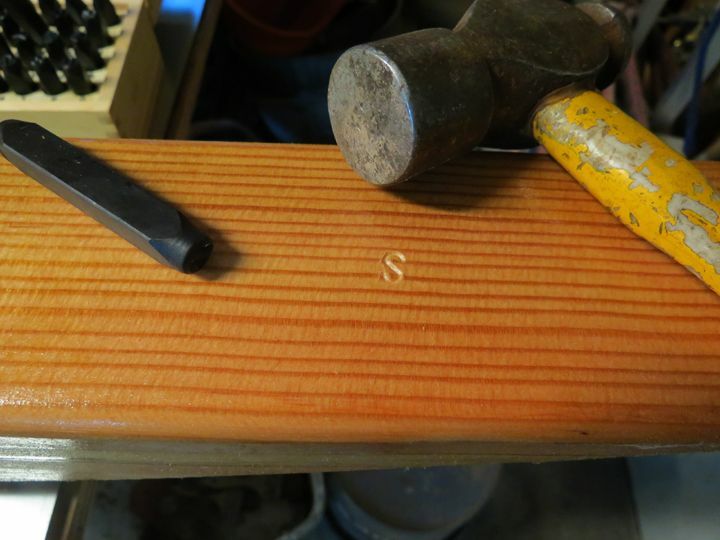 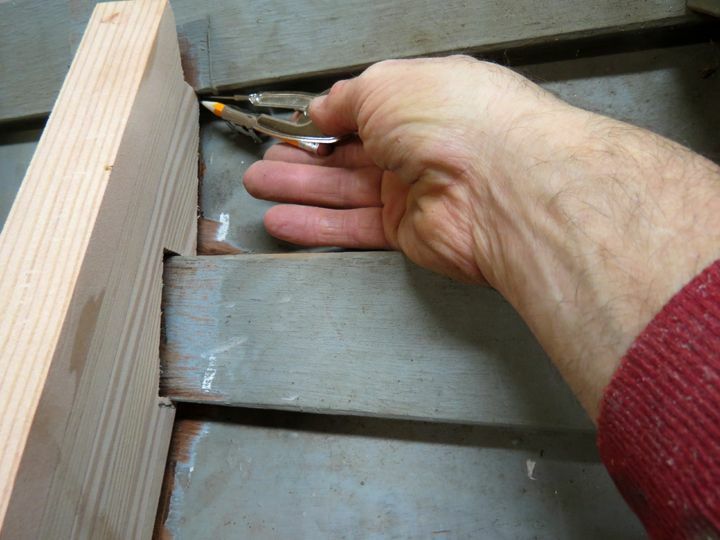 For this step, I used the actual spike to mark where the frame holes needed to be on the face of the floor timber. 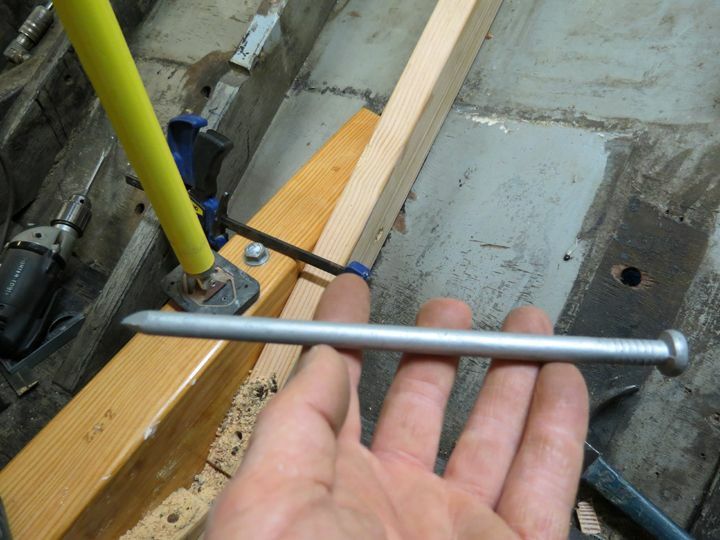 I drilled the floor timber for the new frame bolts. 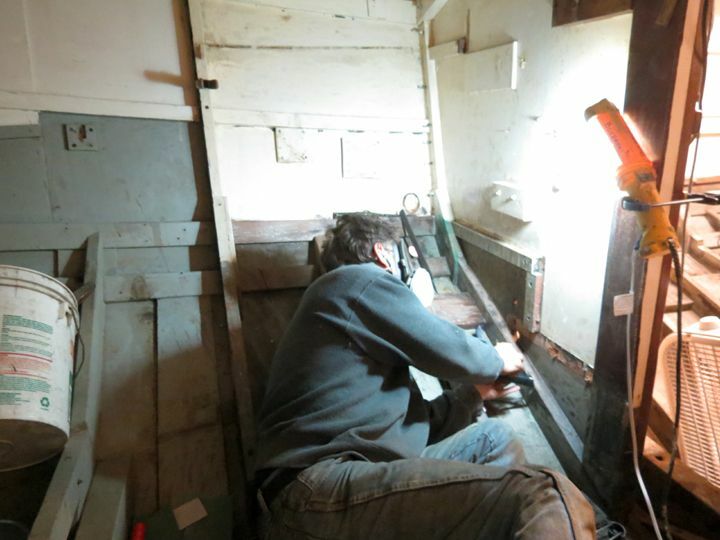 Back inside the boat, everything dry-fit together perfectly! 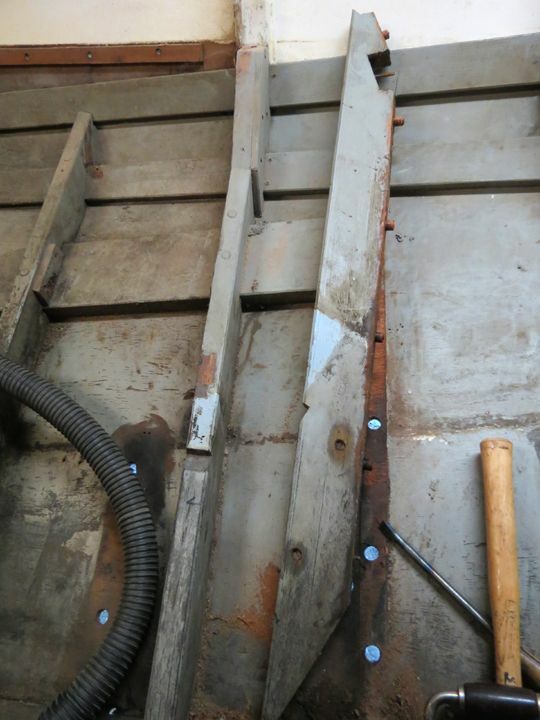 Kind of looks medieval doesn’t it! 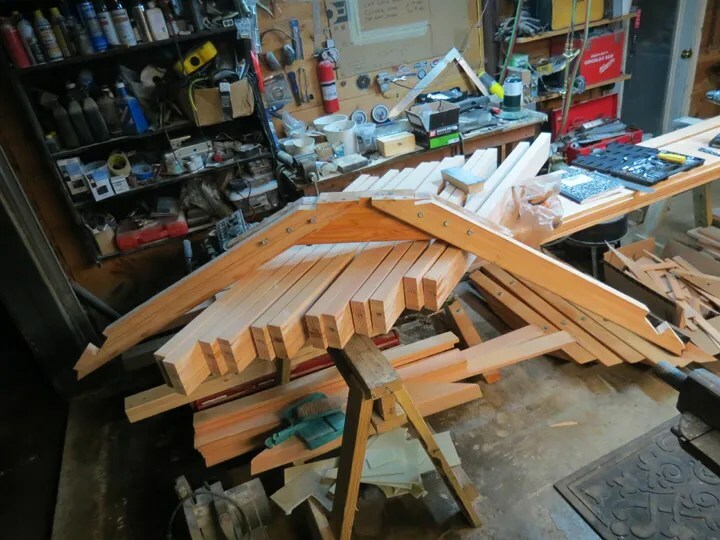 I was able to carry the whole frame / floor timber unit out of the boat in into my shop. 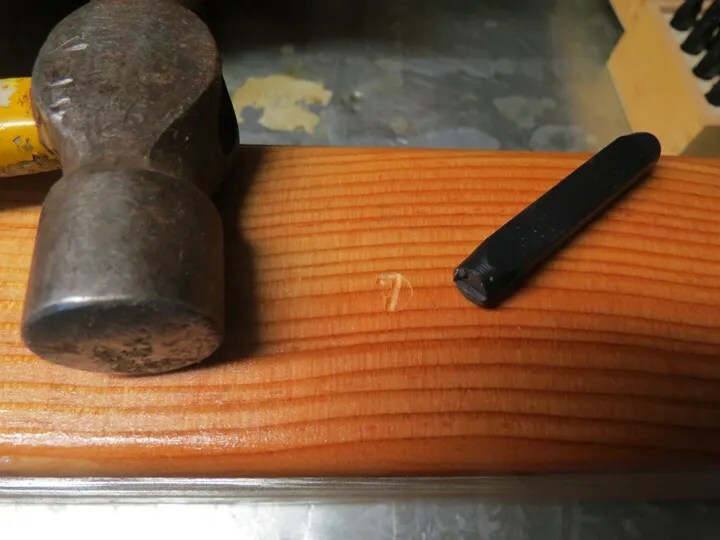 It was solid! 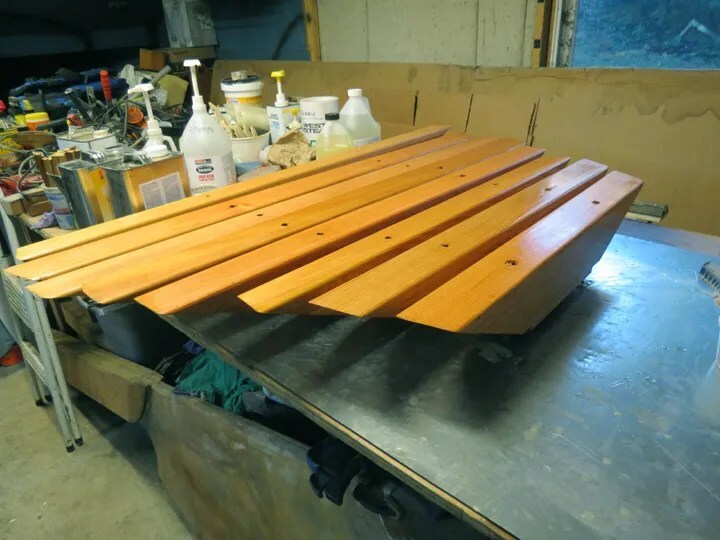 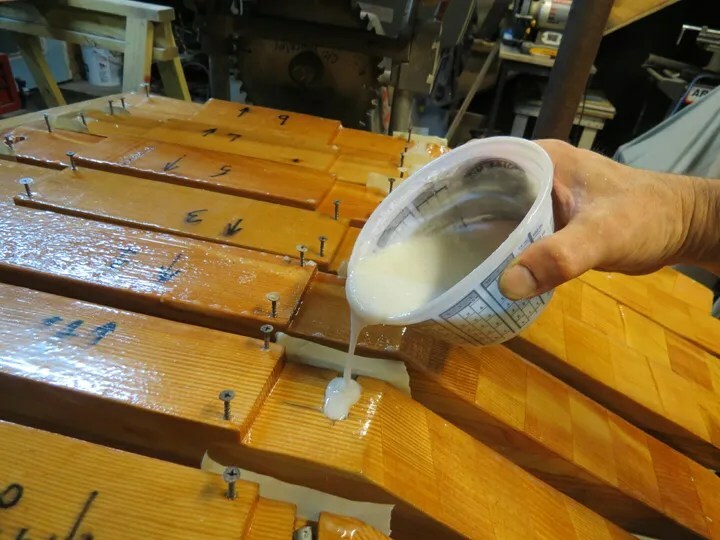 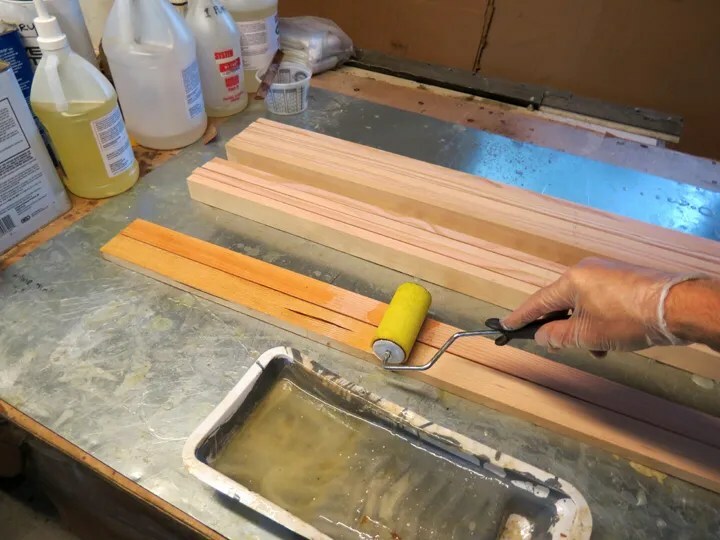 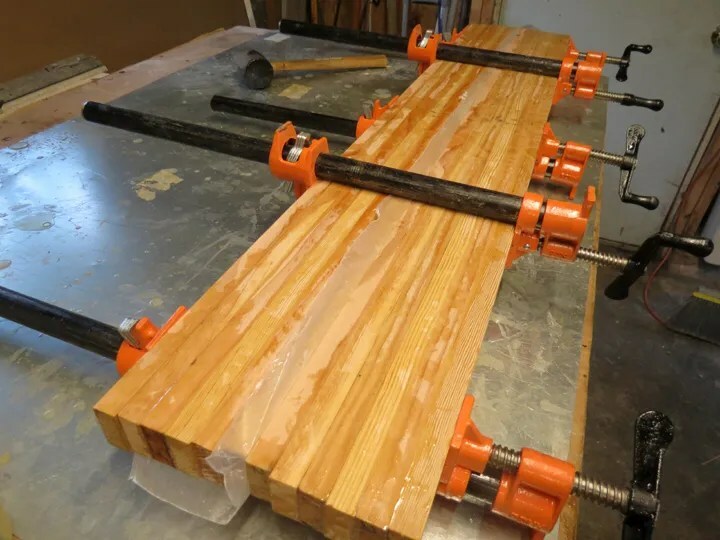 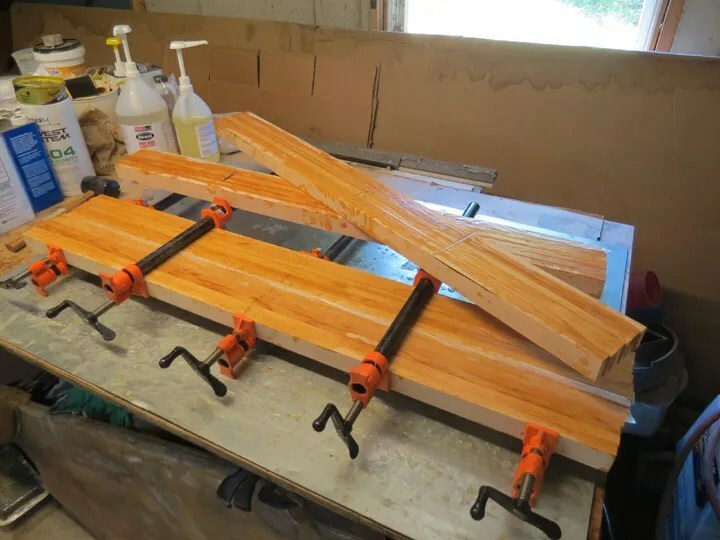 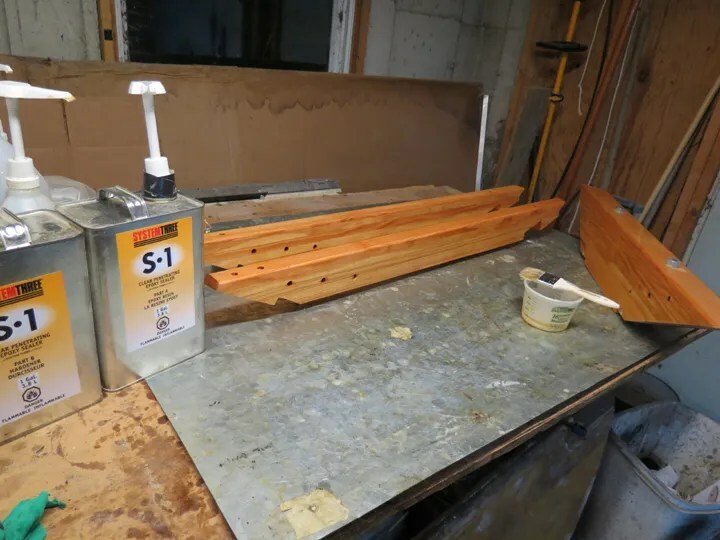 I separated the frames from the floor timber and began applying coats of System Three’s CPES (Clear Penetrating Epoxy Sealer), followed by, System Three general epoxy. 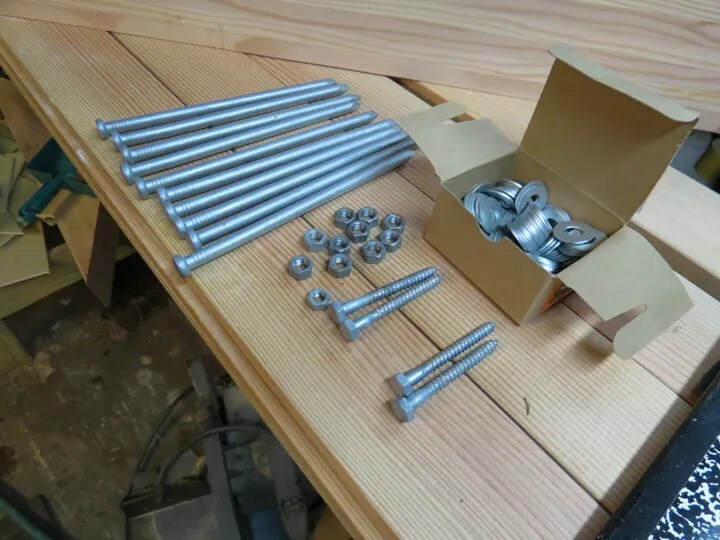 While the frames were drying, I turned my attention to the fastenings that I need to prepare for the installation of the new frames and floor timber. 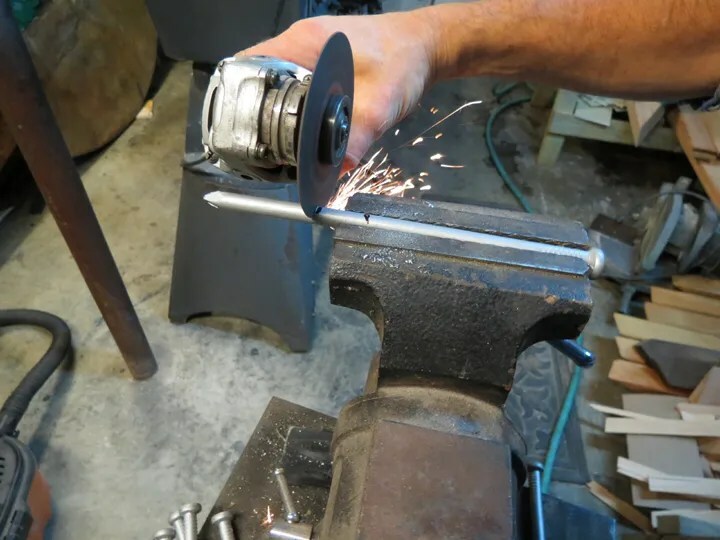 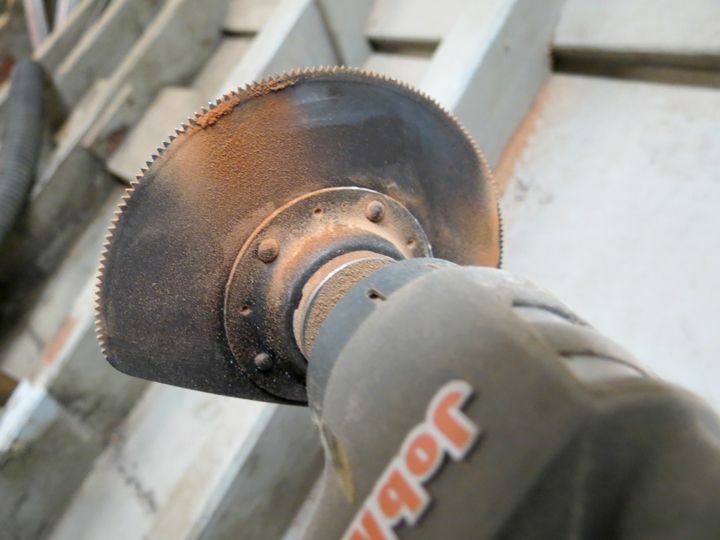 I measured the spikes to the lengths that they needed to be cut to, and using my 4″ grinder and a metal cut-off disc, I lopped off their ends. 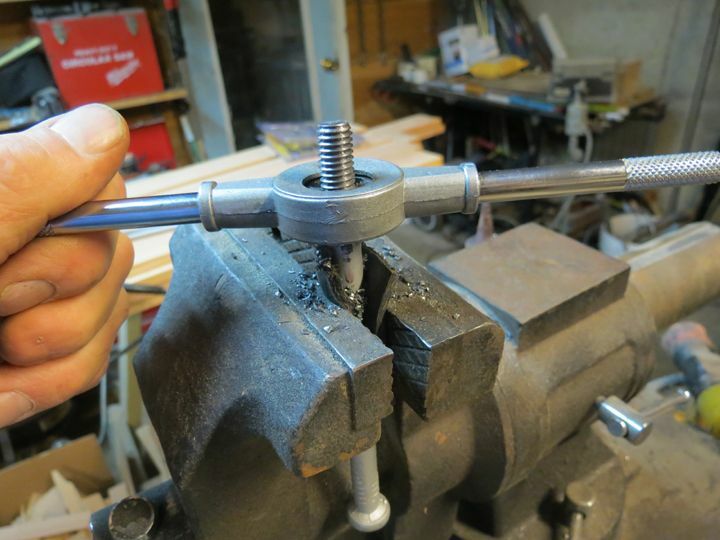 Using my bench grinder, I squared up the ends of the spikes and then ground a bevel so that a threading die would start easily. I cut new threads about one inch in from the end of the spike / now bolt. 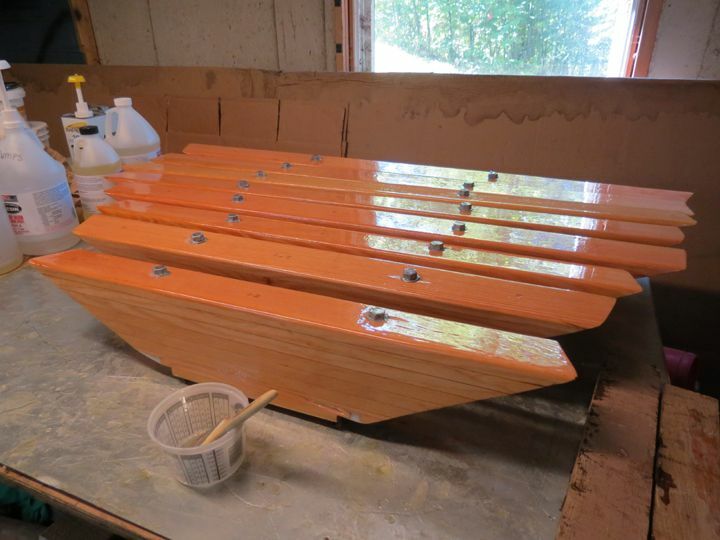 And, another coat of epoxy brushed on to the frames. 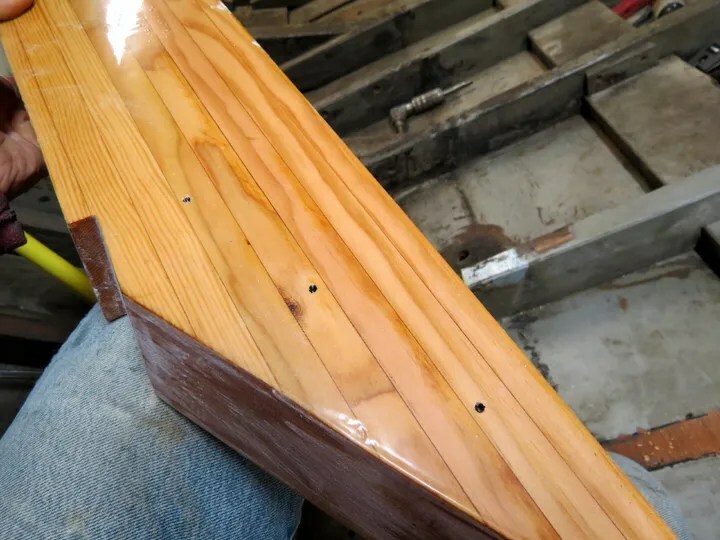 Very soon, I will be able to actually put wood BACK in to the boat! 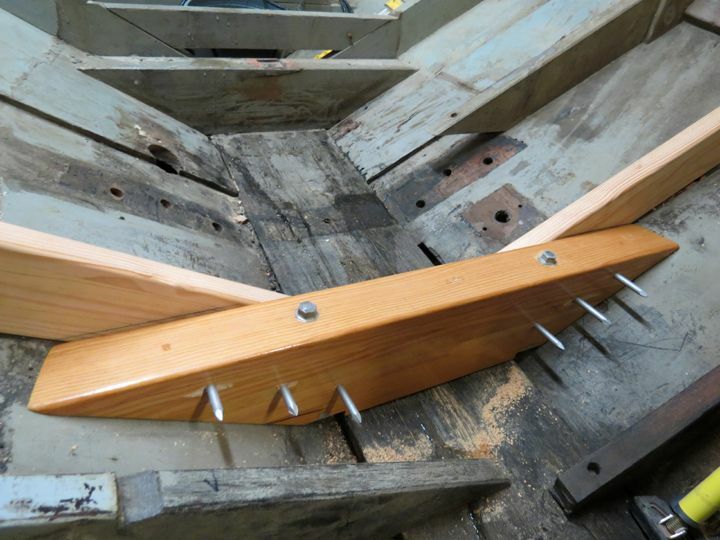 With the frame outside of the boat, using various methods I removed the remaining fastenings that hadn’t broken off. 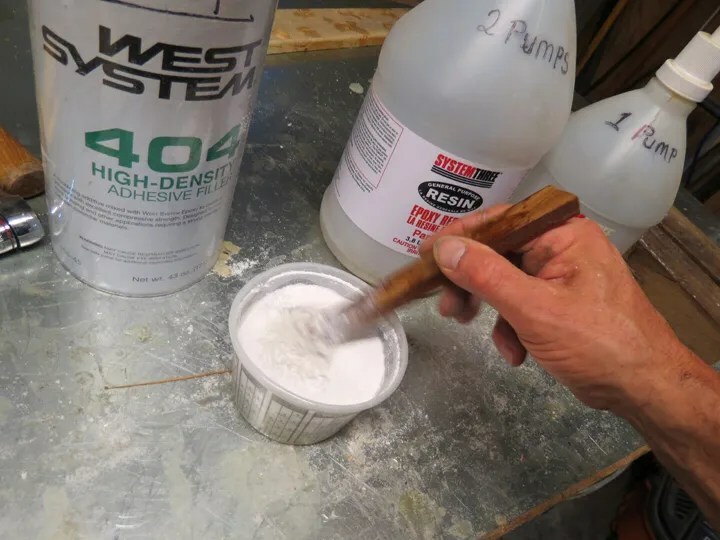 I also used my grinder to clean all of the old resorcinol glue off of the frame. 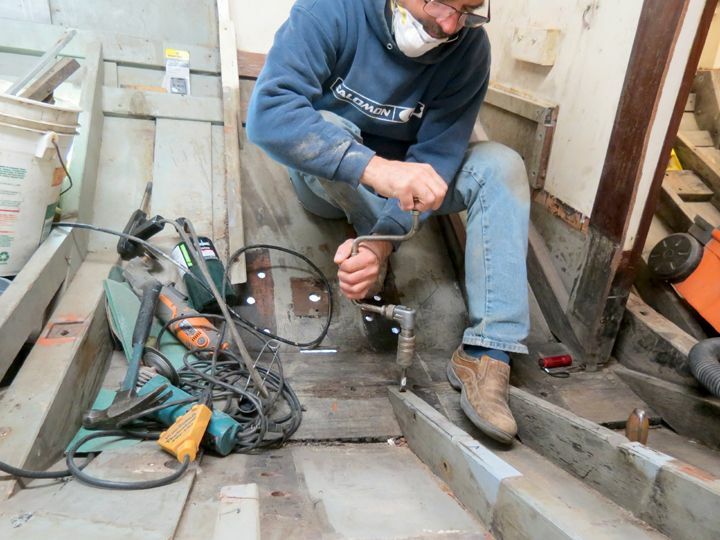 In this image, I am again pointing out the diesel fuel stains that had wicked their way up the frame from the foot. 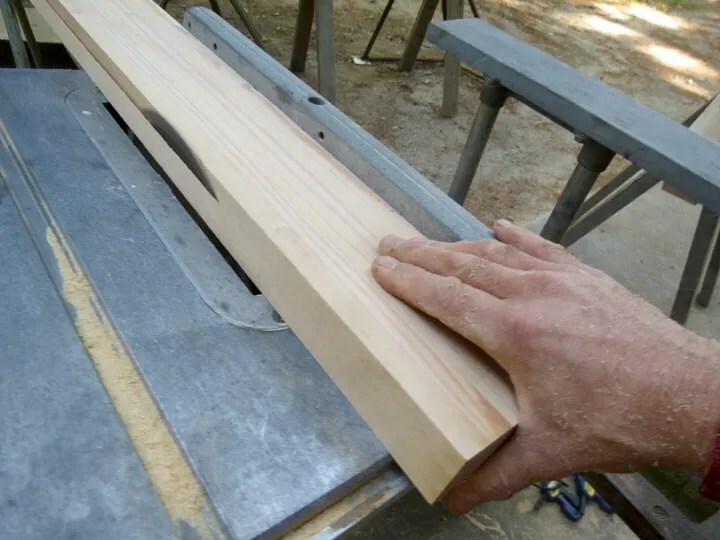 If I stick my nose against the frame towards the upper end, I can’t smell it. 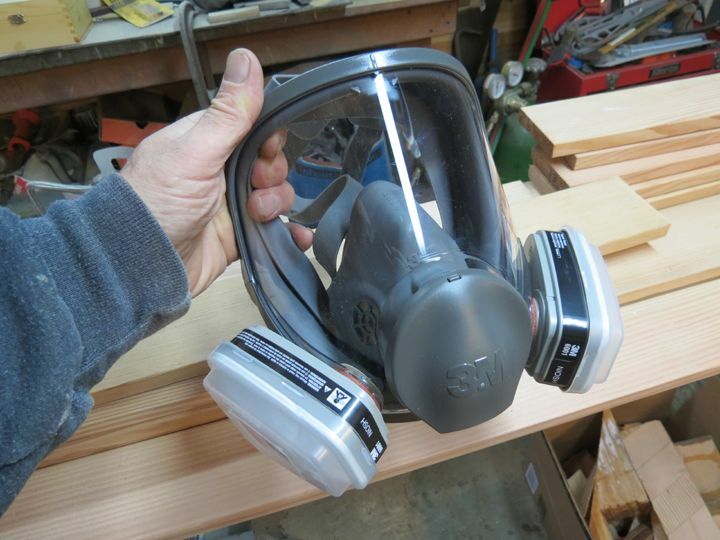 If I take a whiff of the foot of the frame, I can smell the fuel “loud and clear”! 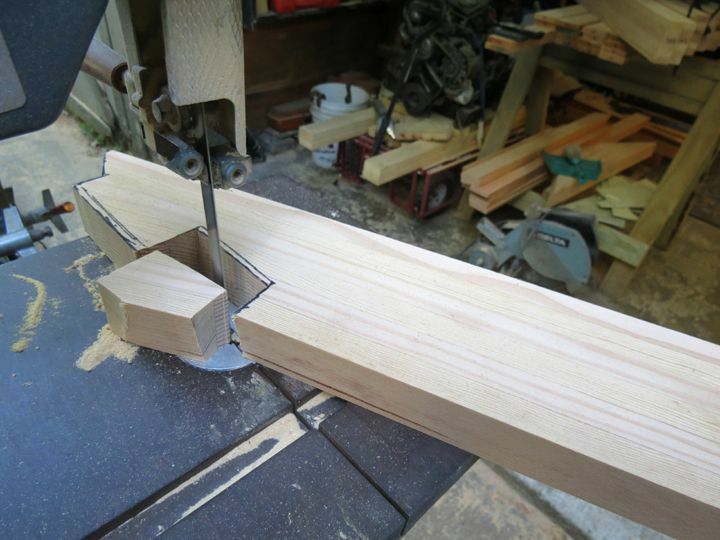 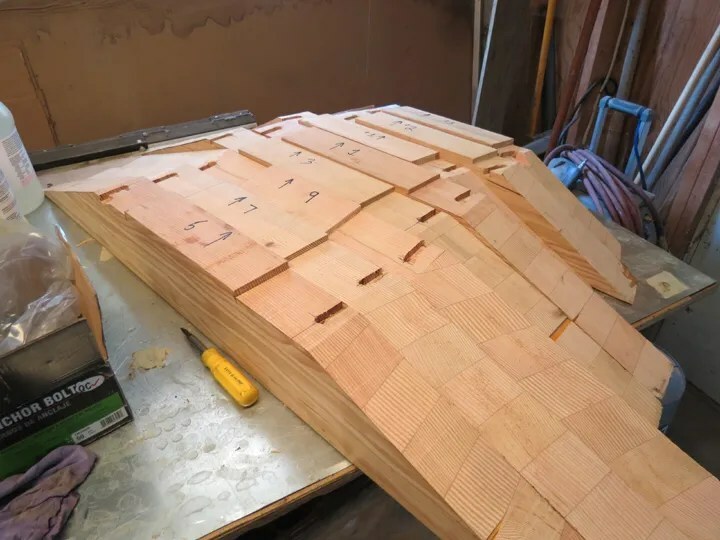 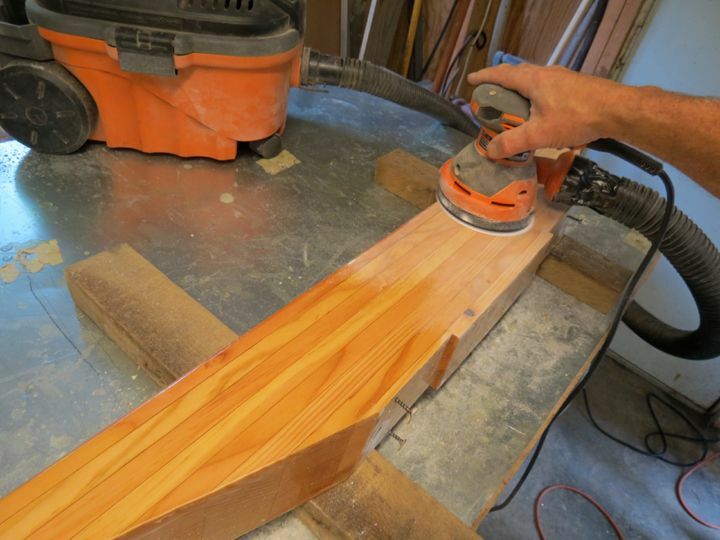 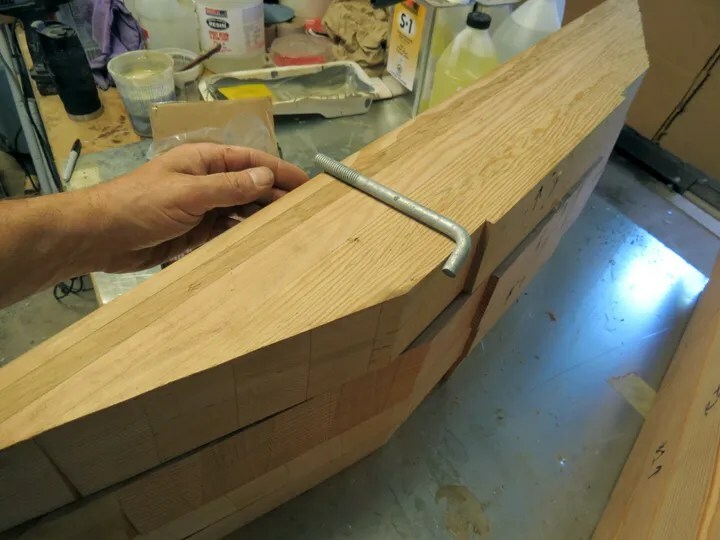 Using the original frame as a “pattern”, I set my tablesaw to the same angle that needs to be cut on the new frame face that will be fitted against the skin of the hull. 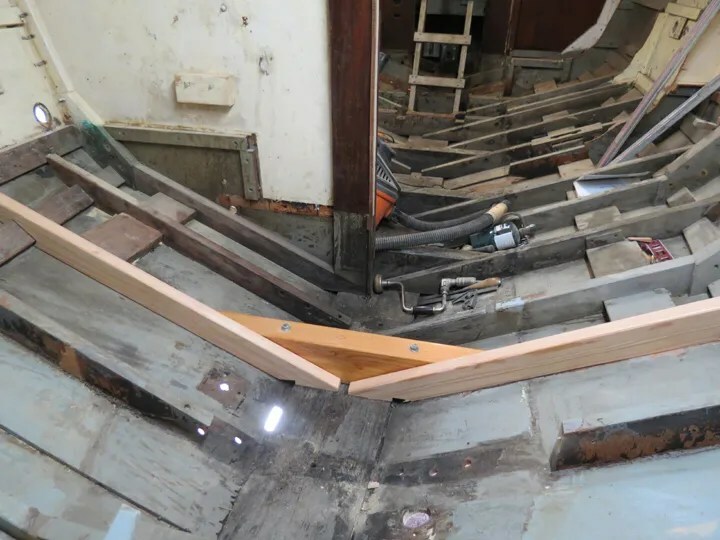 I lined up the old frame with the new frame……..
……then I traced around the old frame; leaving its “footprint” on the new frame. 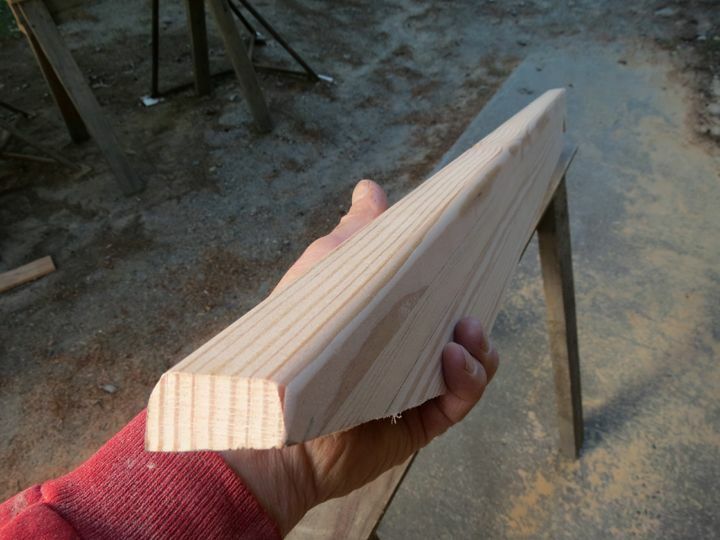 I cut out the new frame using my bandsaw. 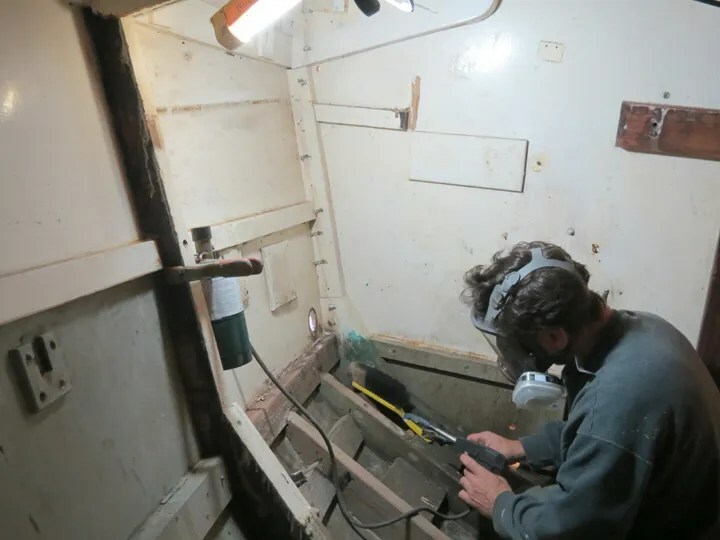 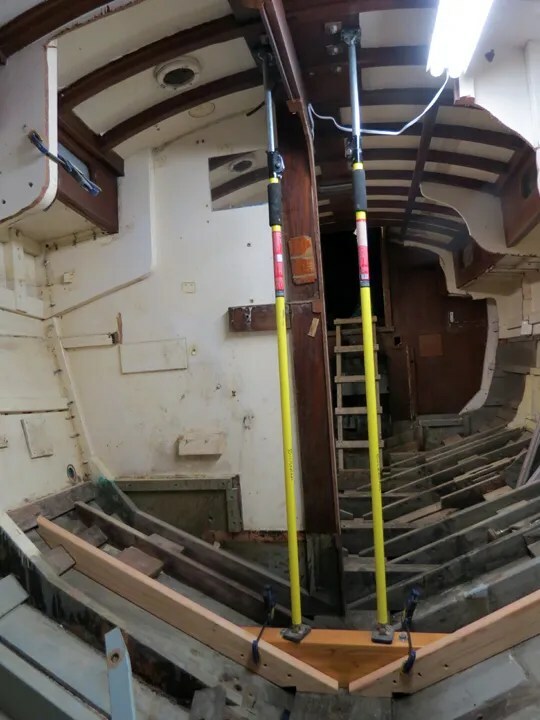 Back inside the hull, I positioned the new frame where it needed to be “tuned” to be properly fitted to the hull. 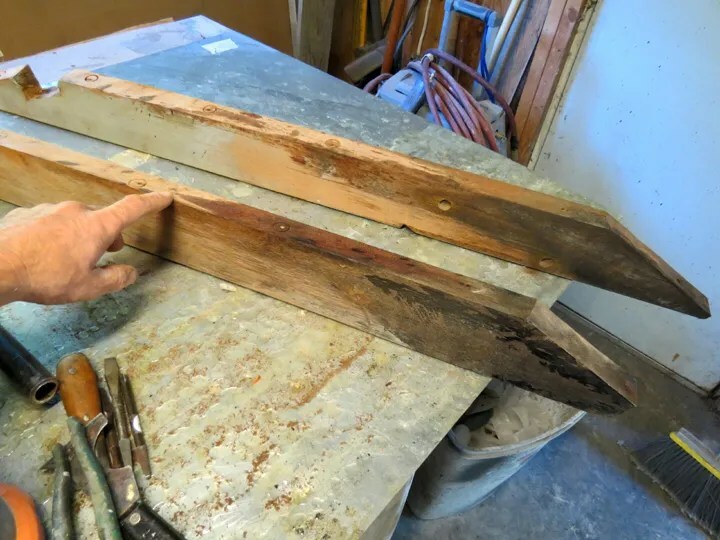 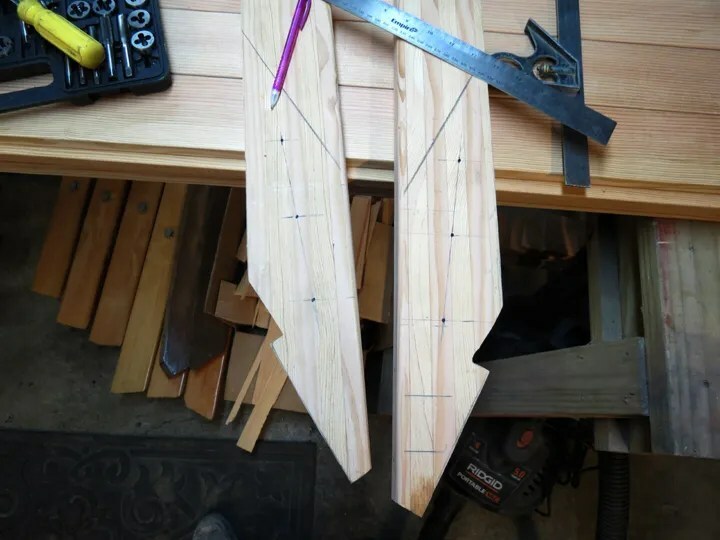 Using a pair of scribes, I marked the areas of the new frame that needed to be “whittled” and ground away so that it would sit snug against the chine long, the skin of the hull, and the keelson. And, here are the Port and Starboard frames fit! 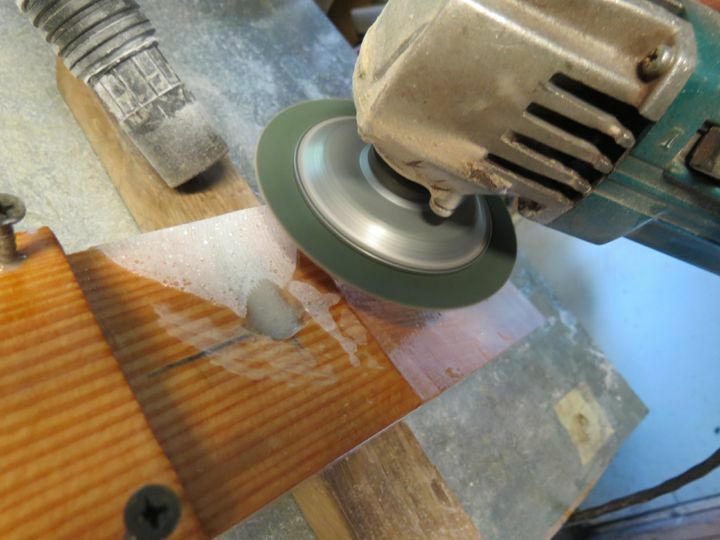 A final detail was to rout a 1/4″ roundover on the top edges of the frame. 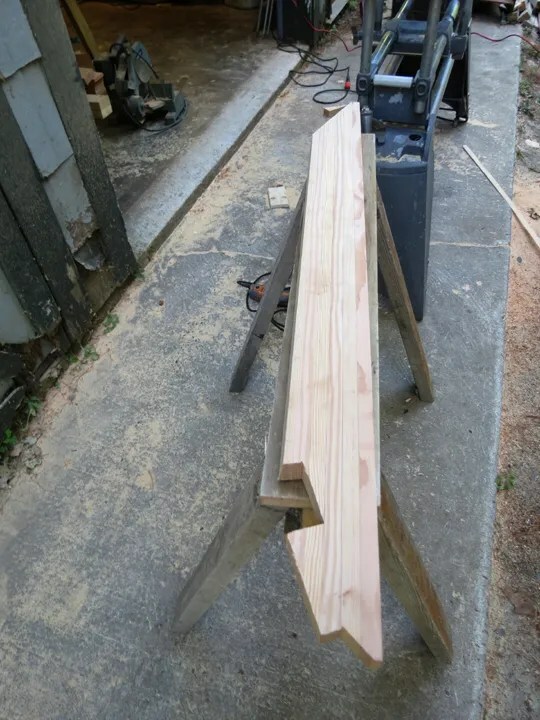 The next step is to fasten the matching floor timber up to these two frames. 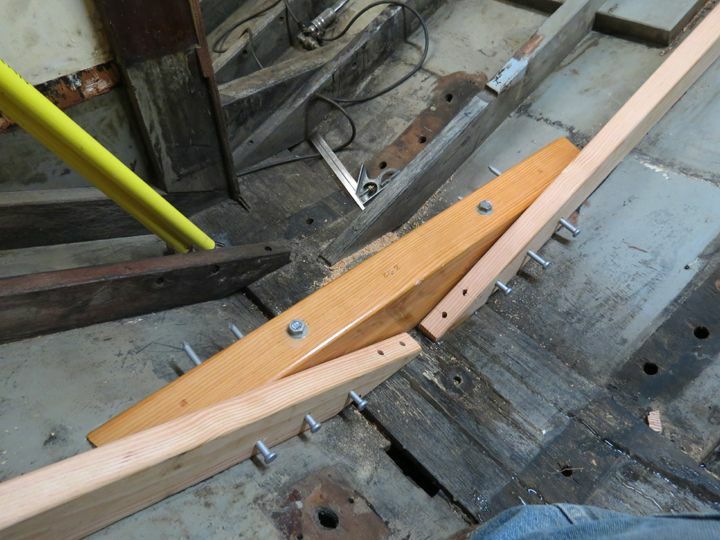 This image shows what this will roughly look like. 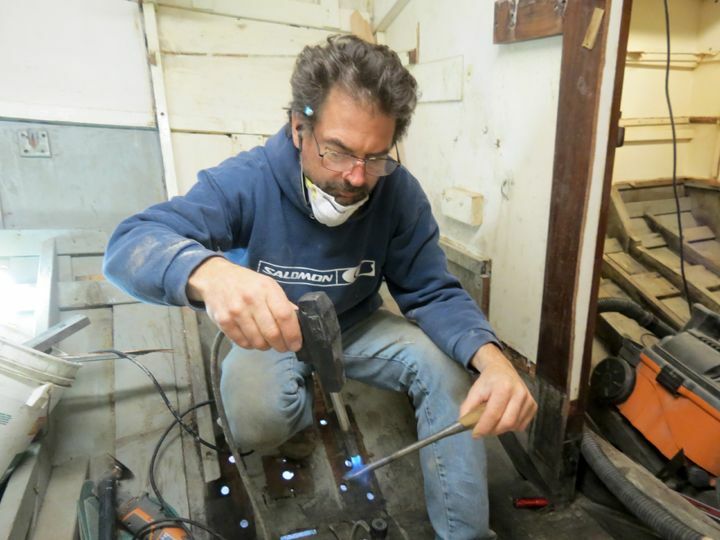 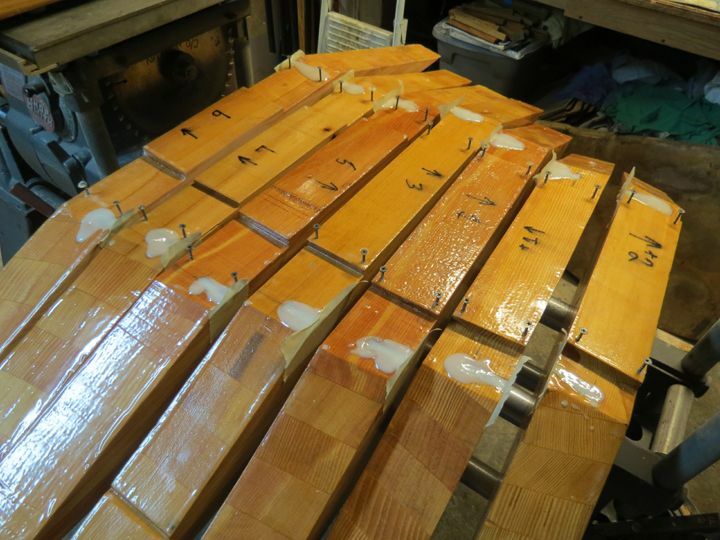 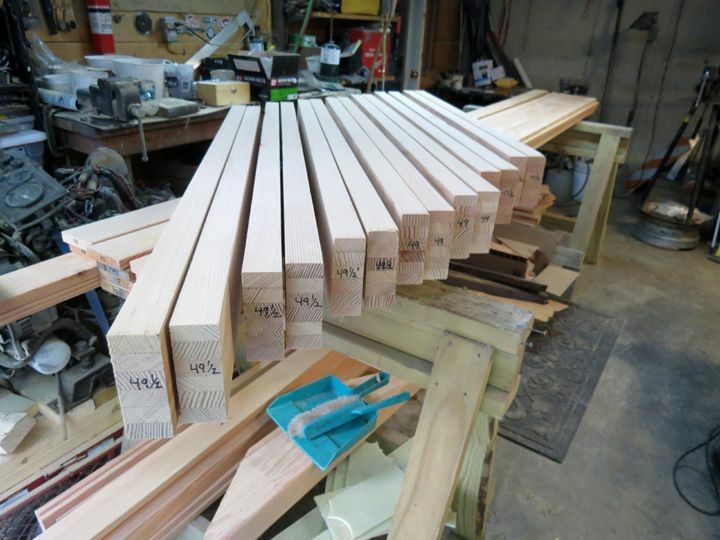 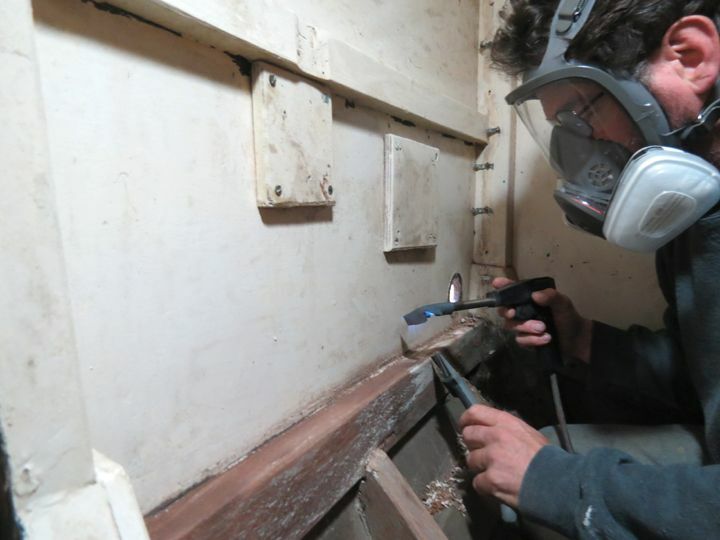 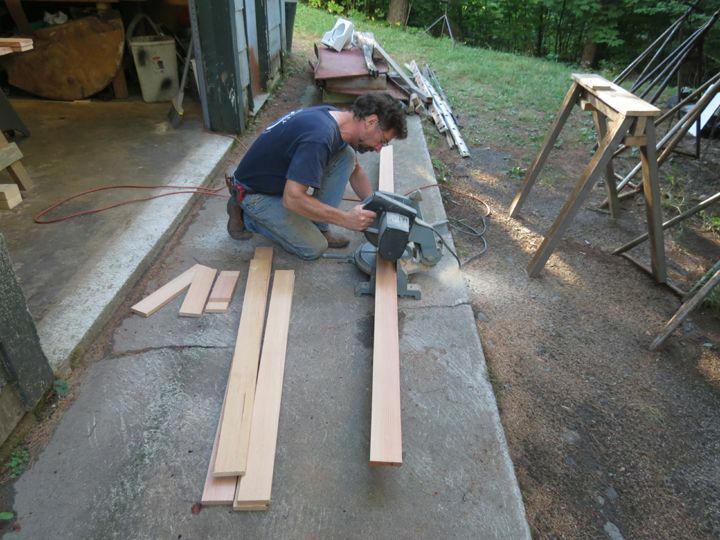 With the first batch of “frame stock” made, it was time to begin fitting the new frames into the interior of the hull. 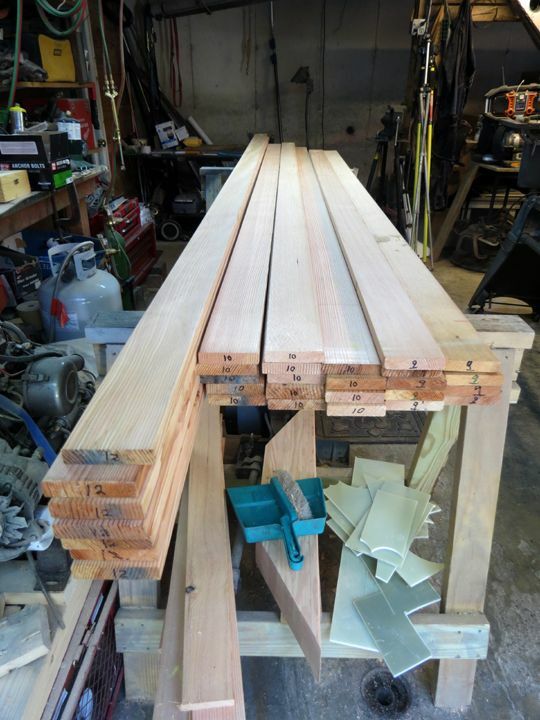 Before that could be done, I had remove the old frames. 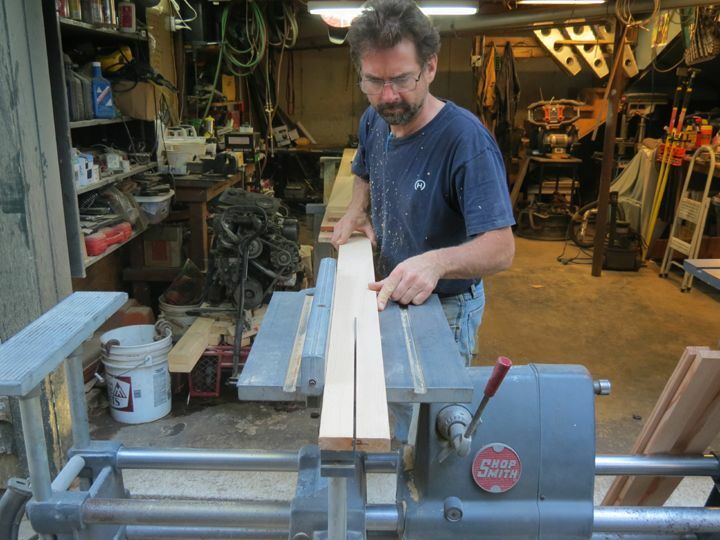 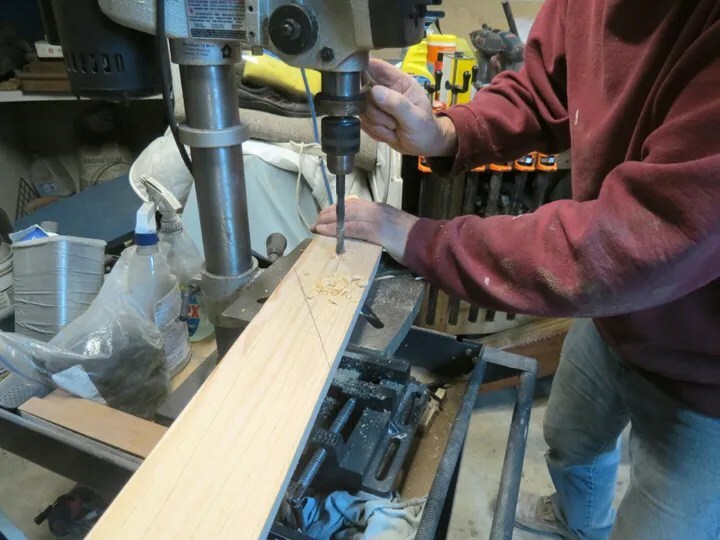 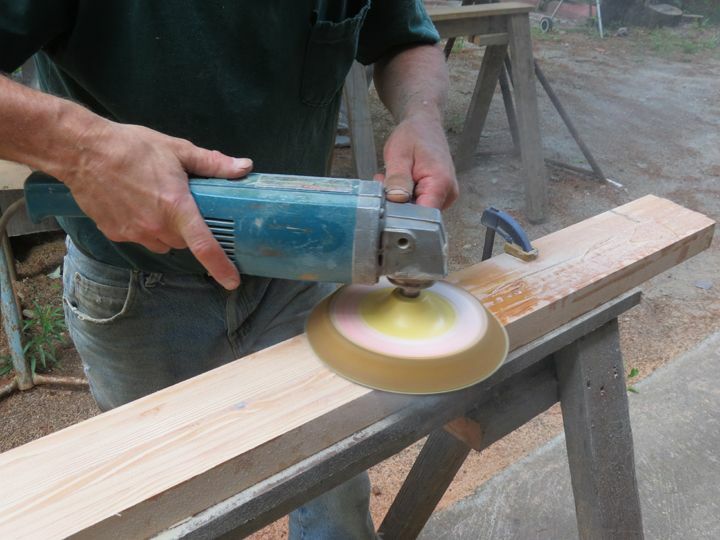 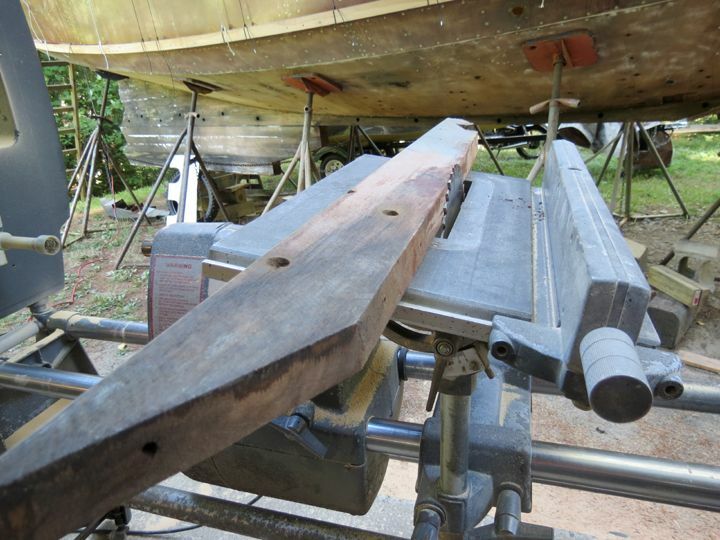 The top portion of the lower frame is fastened by a wood screw driven through the frame head, and into the chine log. 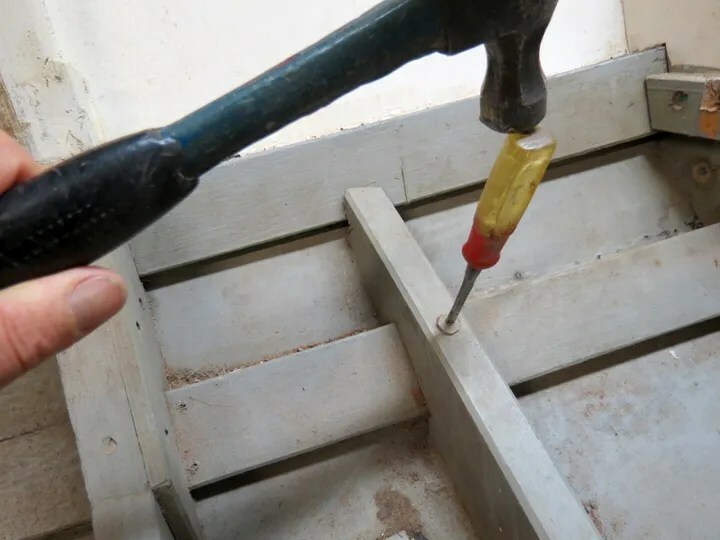 I drove a chisel into the wooden plug that covers the head of the screw and “chopped” it out of the countersunk hole it was glued into. 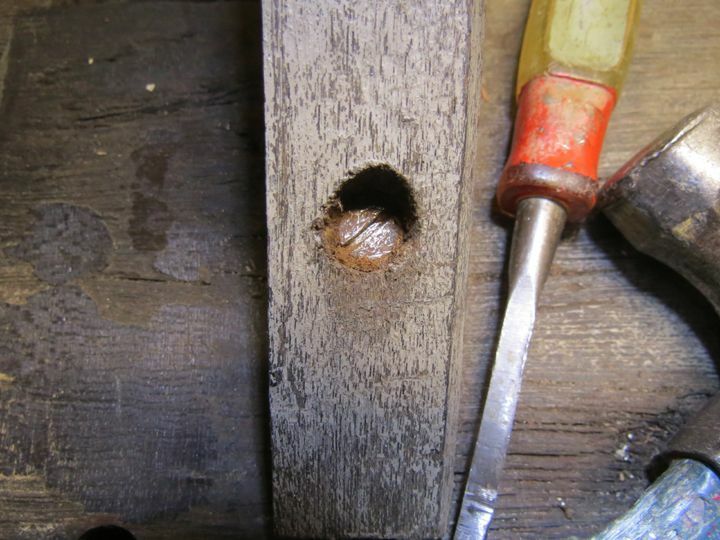 I did the same at the bottom of the frame where a woodscrew was driven through the frame-foot and into the keelson; revealing the head of the screw there as well. 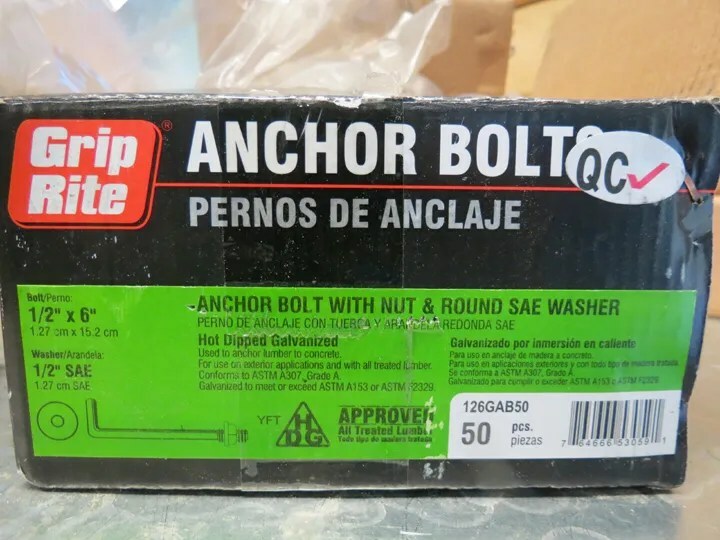 I have been finding that, most of the steel fasteners that are located close to, or in the bilge area, are “rotten”. 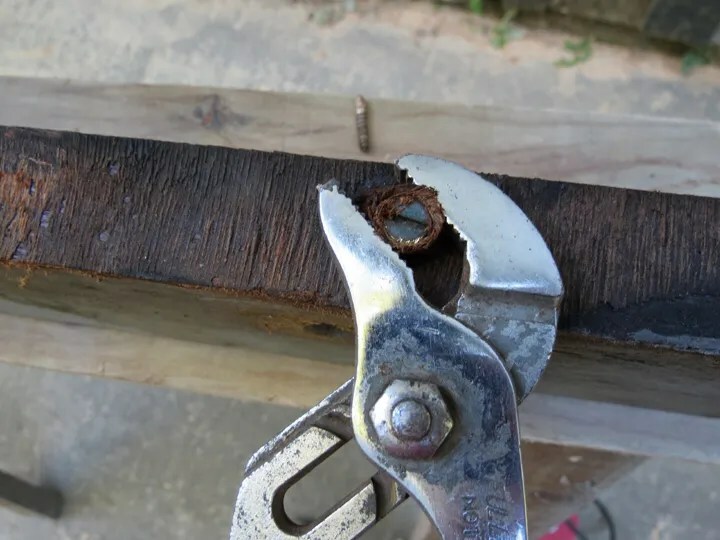 The fasteners have either completely rusted away, or the threads have been “eaten” and are useless. 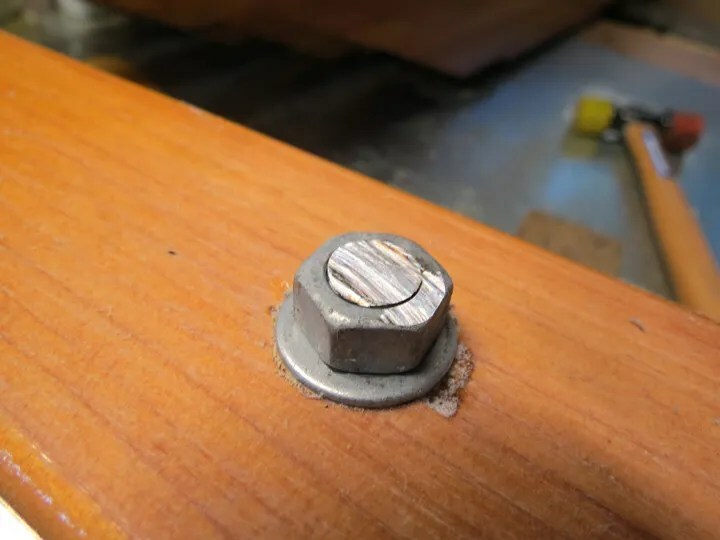 The fastener just spins in a “stripped” fashion and won’t back out of its position. 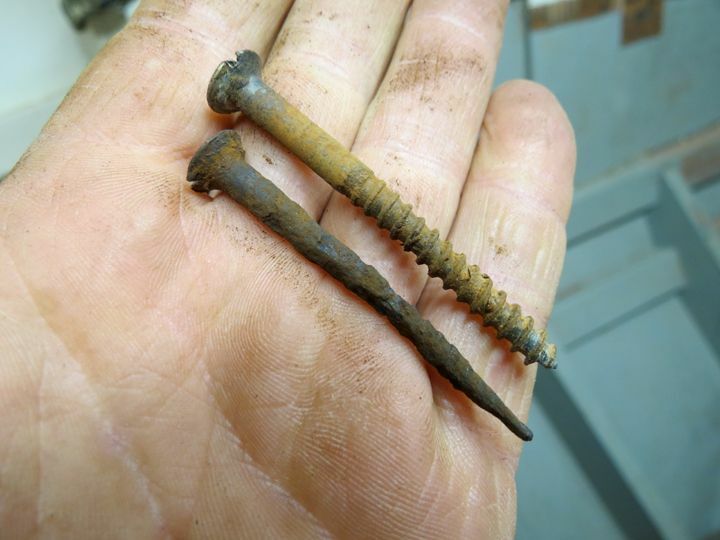 You would think that it would be easy to get these old fastenings out! 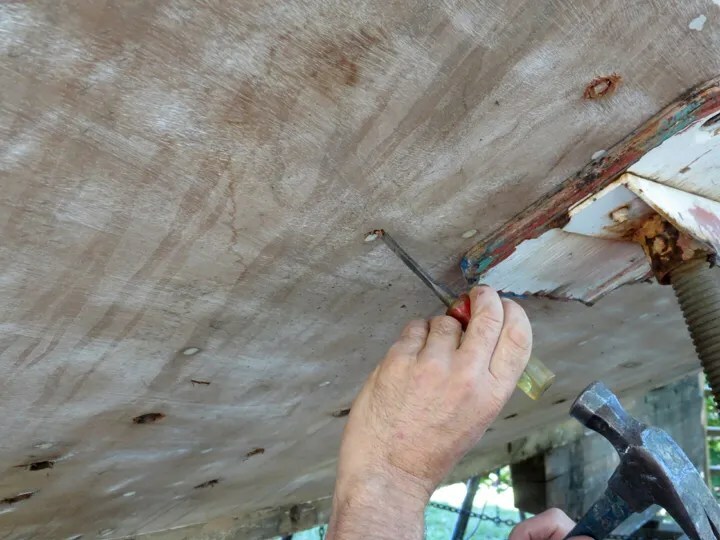 But, there is also old resorcinol glue that is present from the original construction and it STILL has a grip on some of the fastenings. This is really tough stuff! 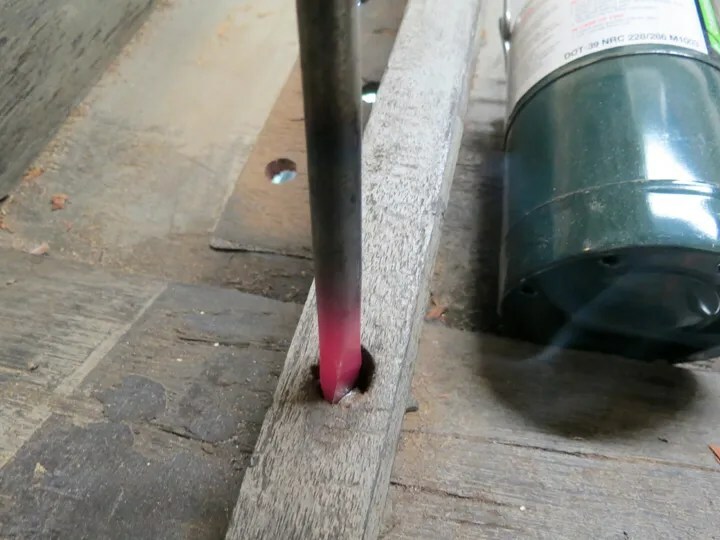 To help with removal of these screws, I heated up the tip of an old screwdriver with my propane torch……. 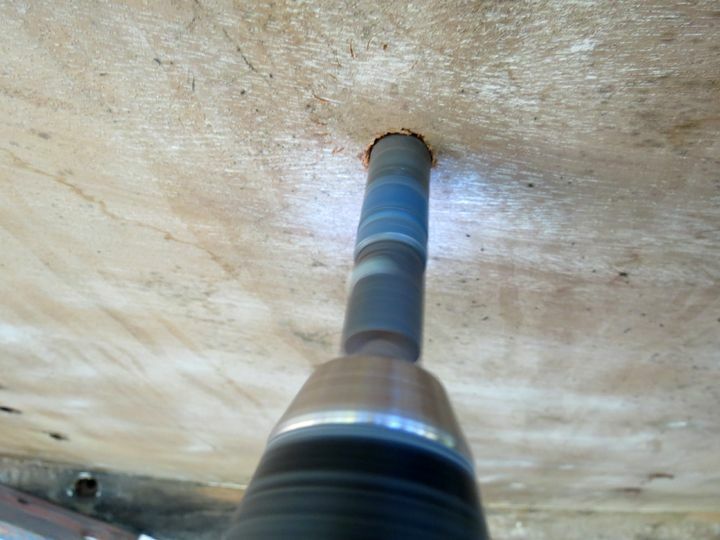 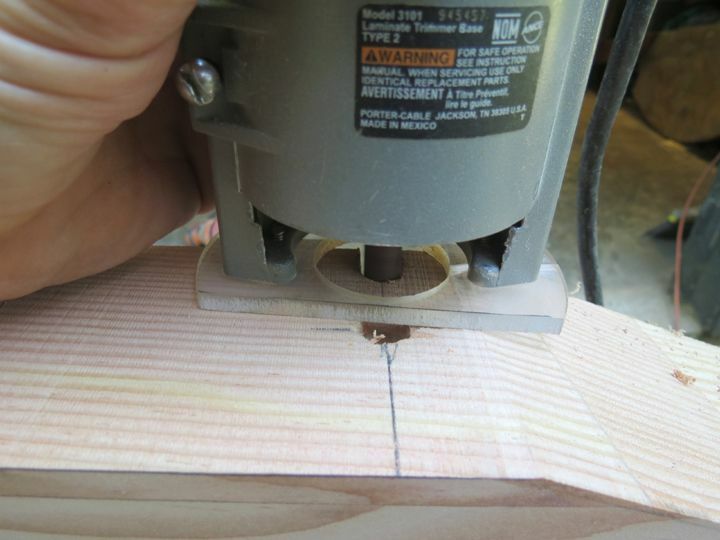 ……..and then I placed the “red hot” tip into the slot of screw head. 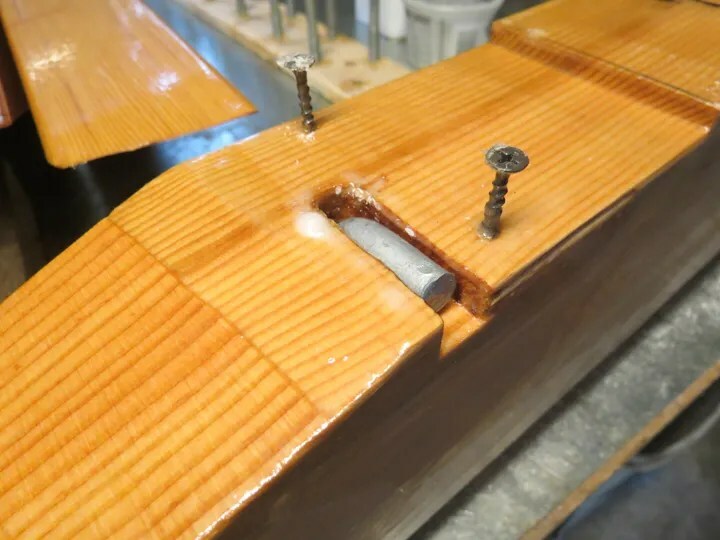 The heat then transferred down through the threads of the screw, helping to break the fastener free from the resorcinol glue. 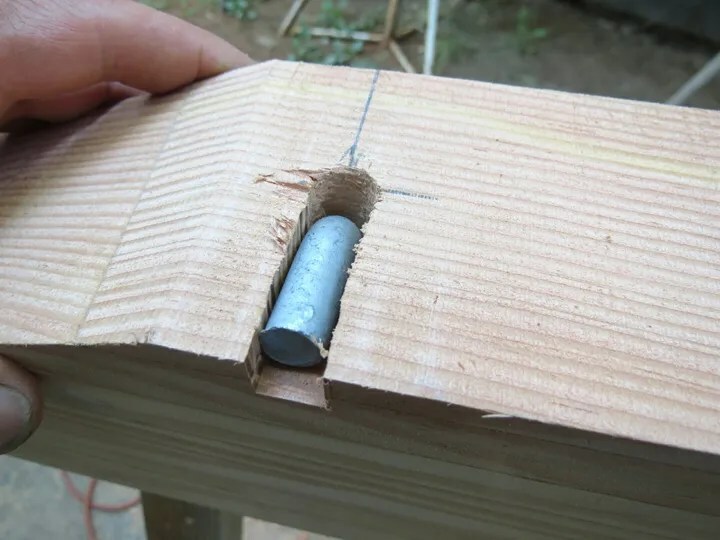 Once I could wiggle the screw “back and forth” with the screwdriver, I switched over to using my brace for more leverage to back the fastener out. 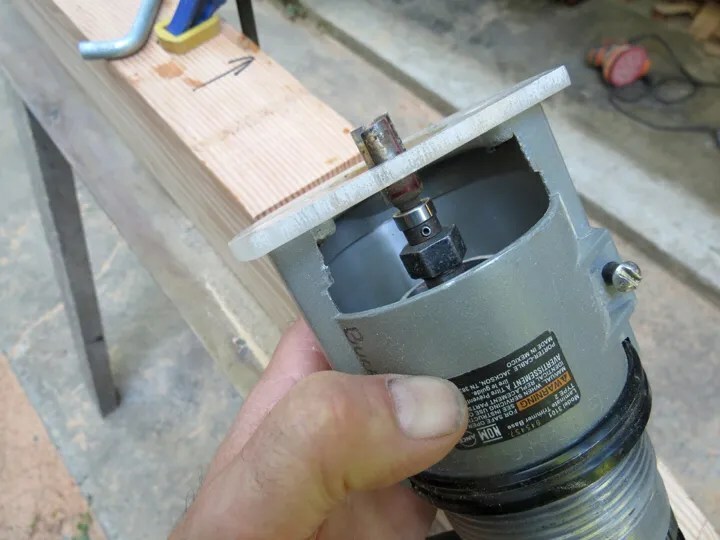 The screws usually broke off before completely removing them. 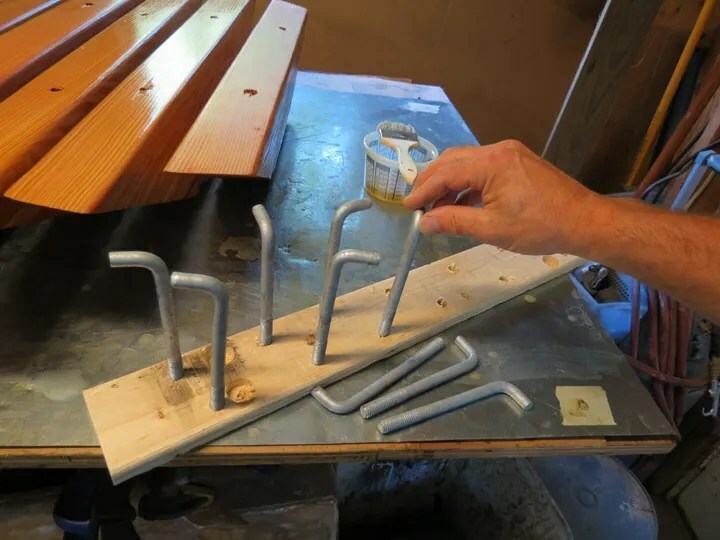 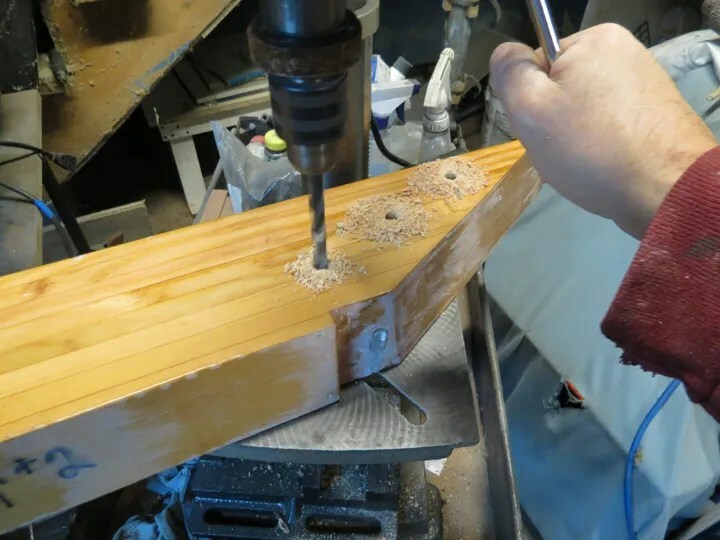 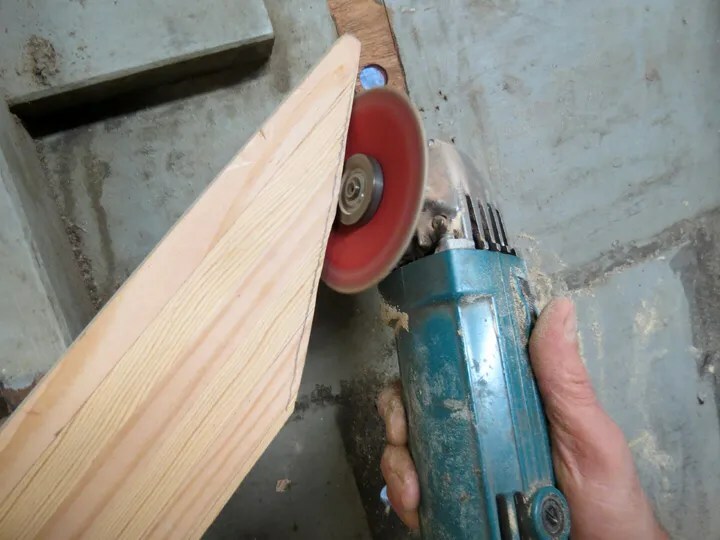 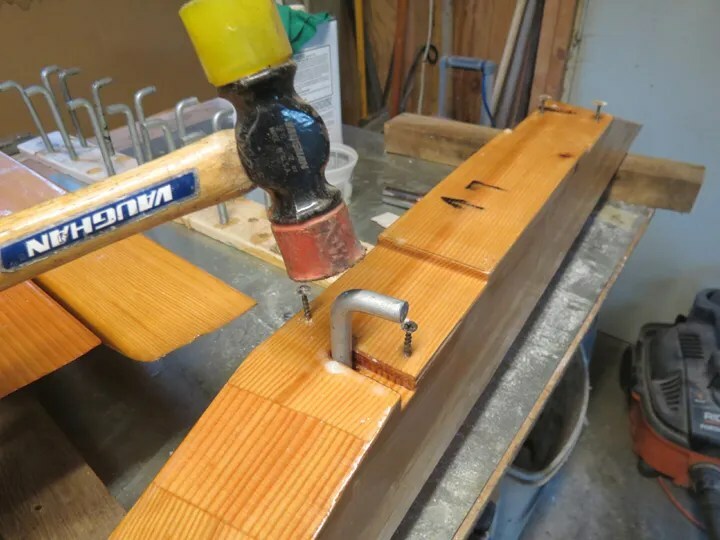 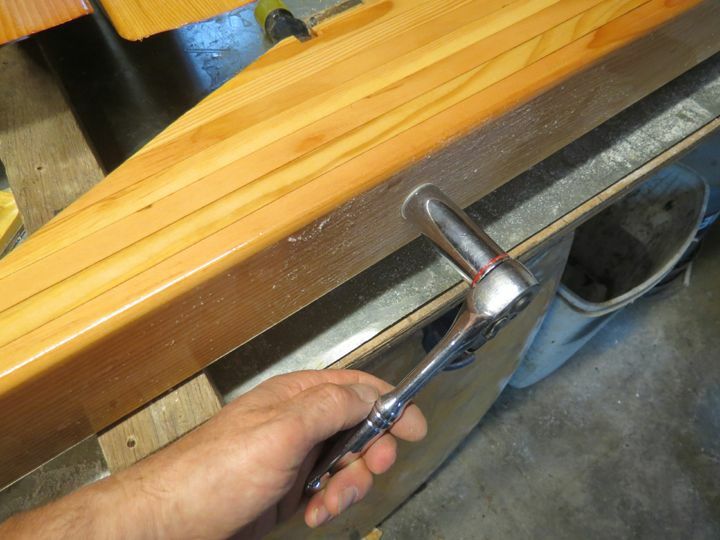 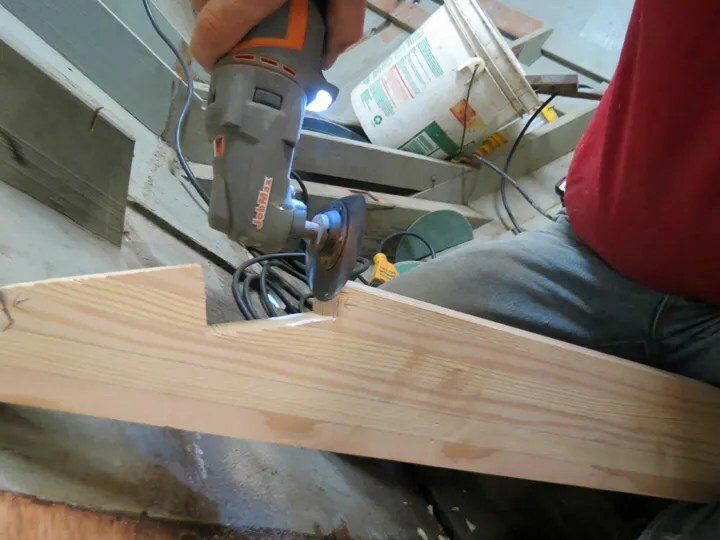 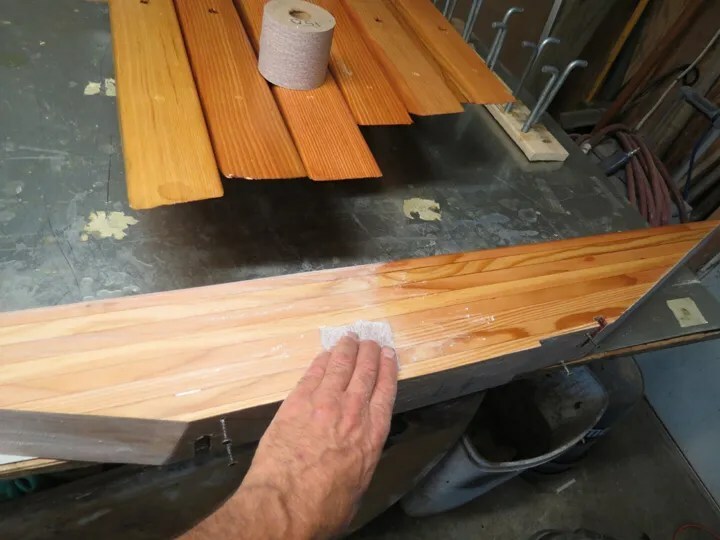 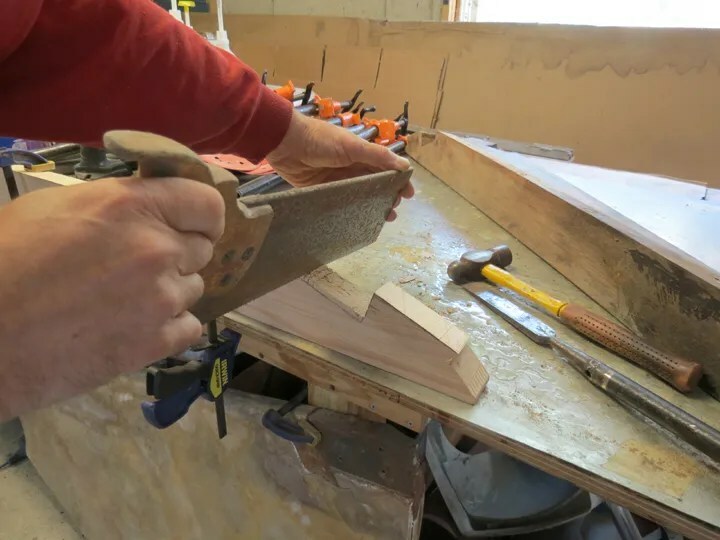 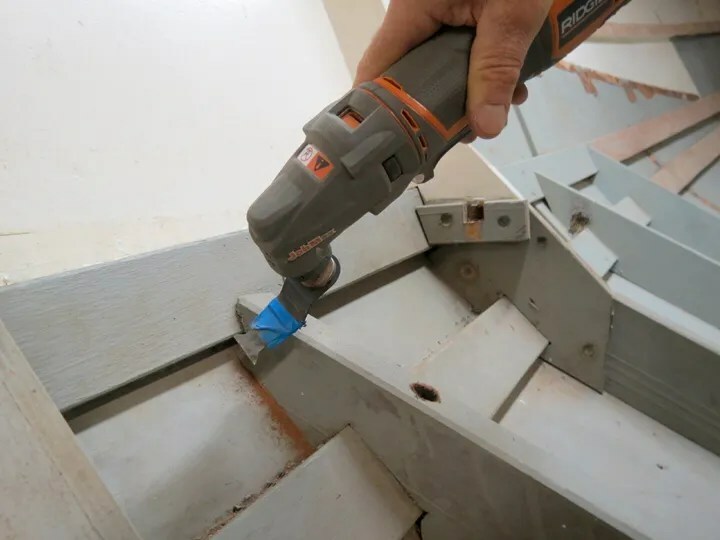 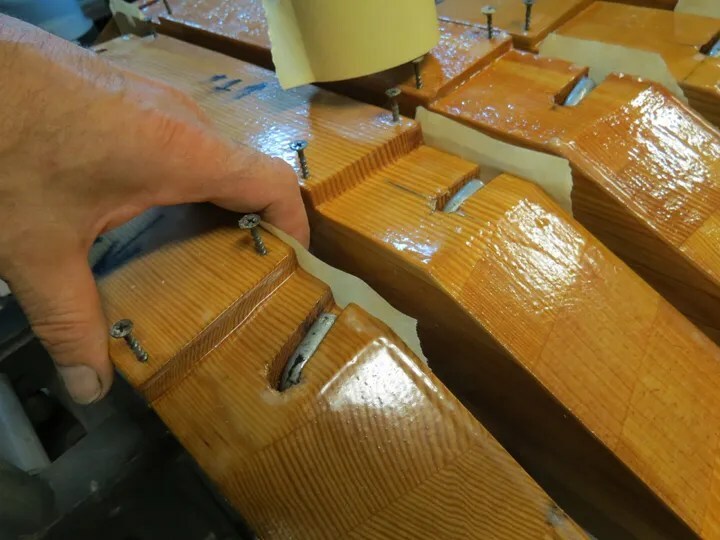 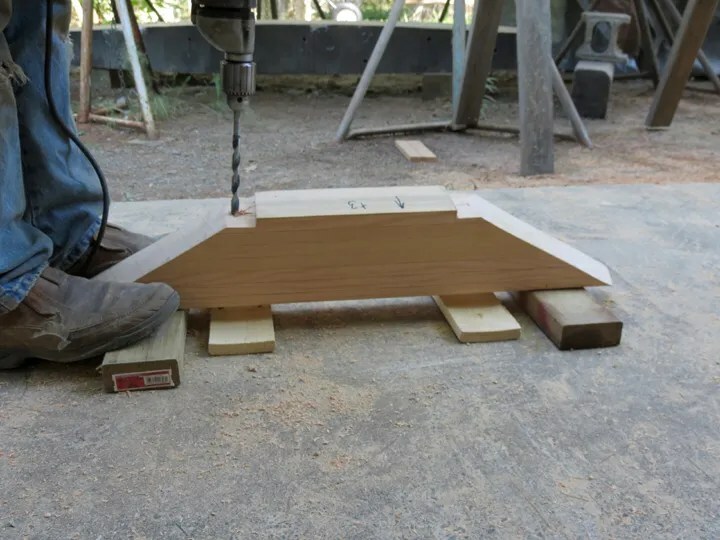 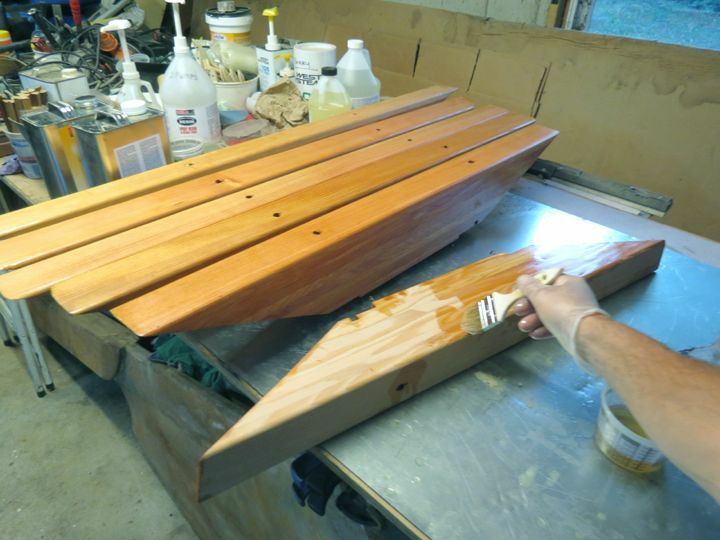 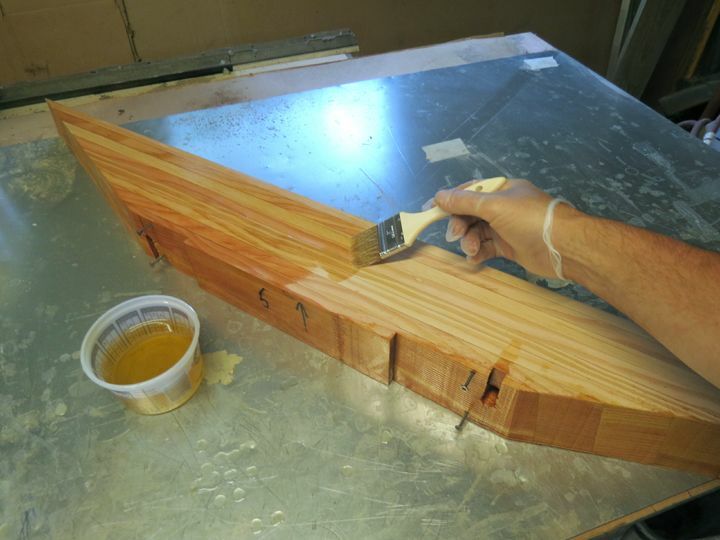 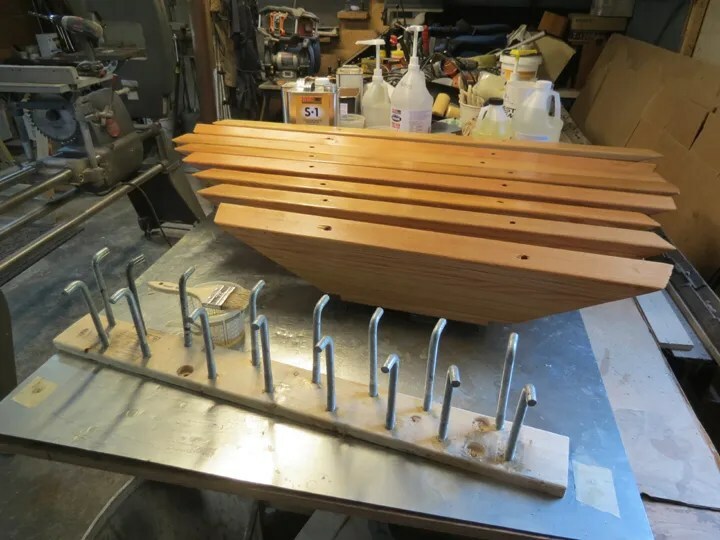 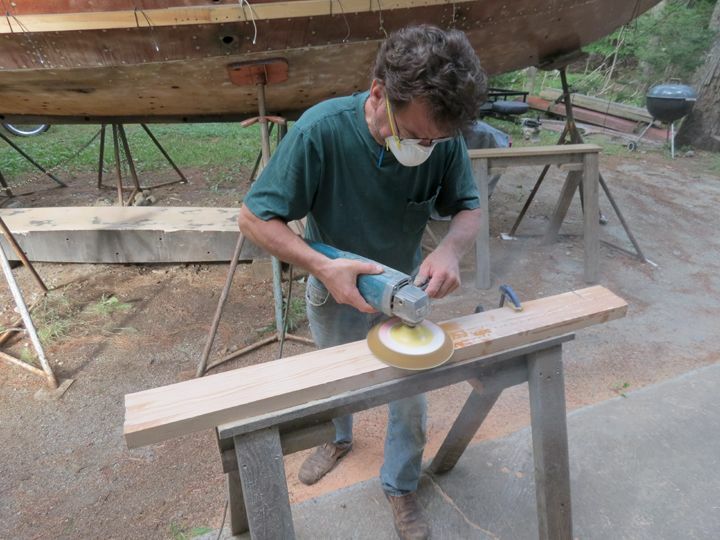 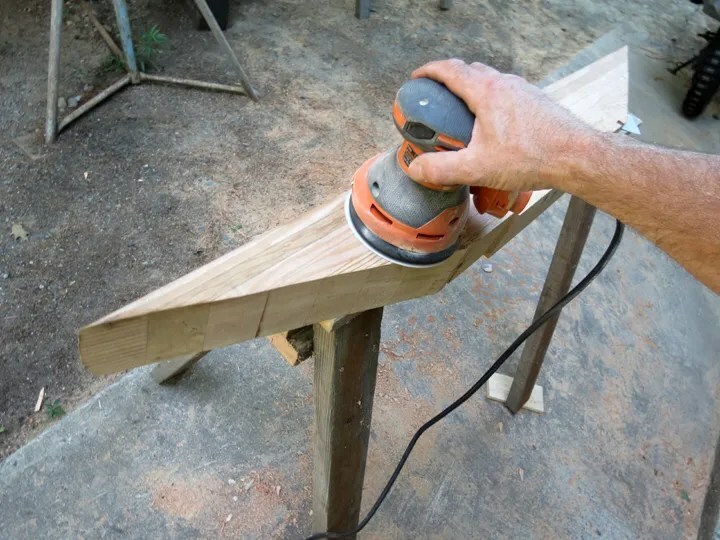 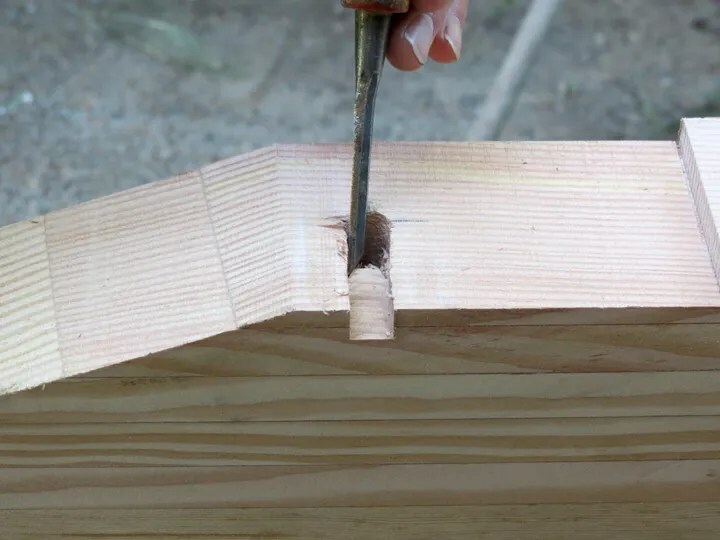 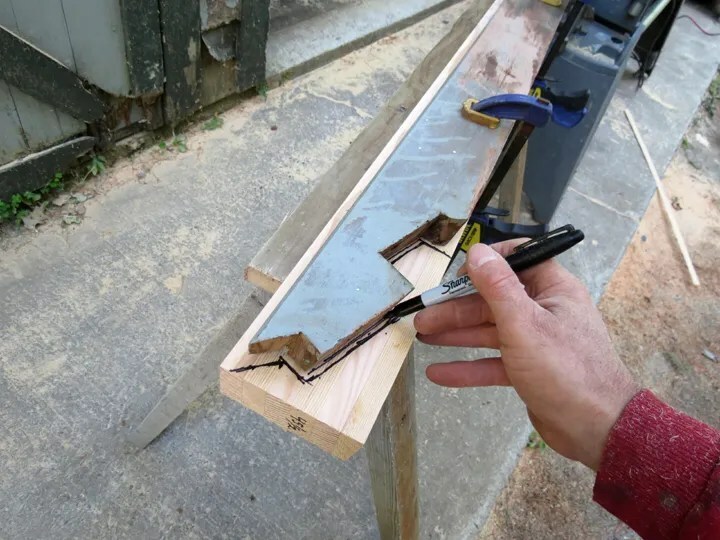 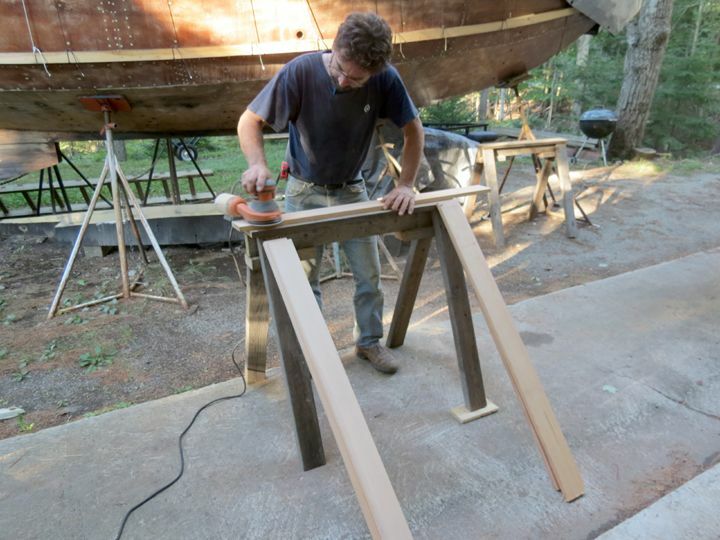 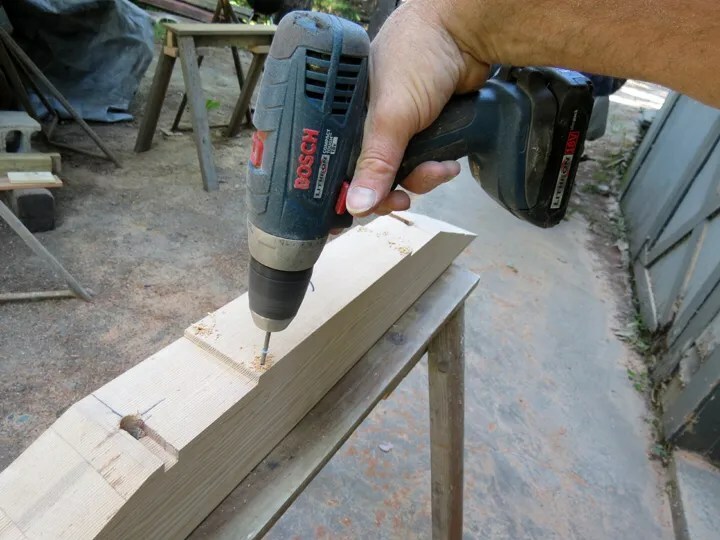 With the fastener removed at the frame-head and also at the frame-foot, I used a multi-tool to score the interior face of the plywood skin; creating a “break” between the glue joint of the frame and the hull surface. 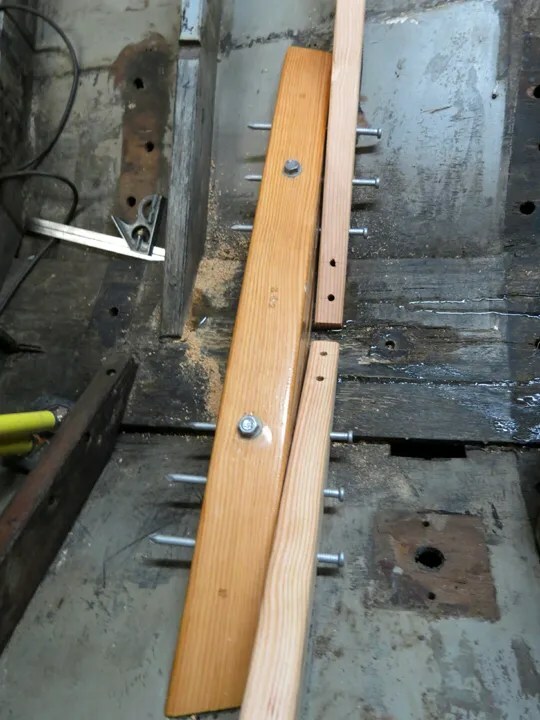 Once all of the preparation work was done on the inside, I moved outside to remove the fastenings that held the plywood skin to the frames. 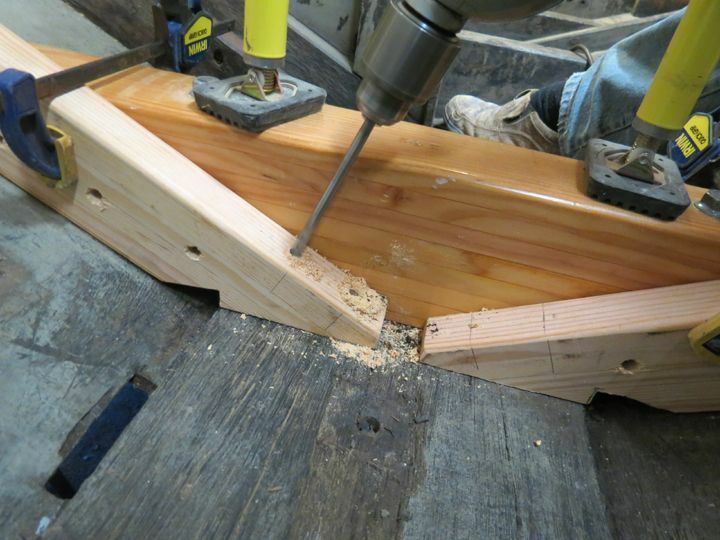 I used the exact same procedure that I implemented to remove the floor timbers. 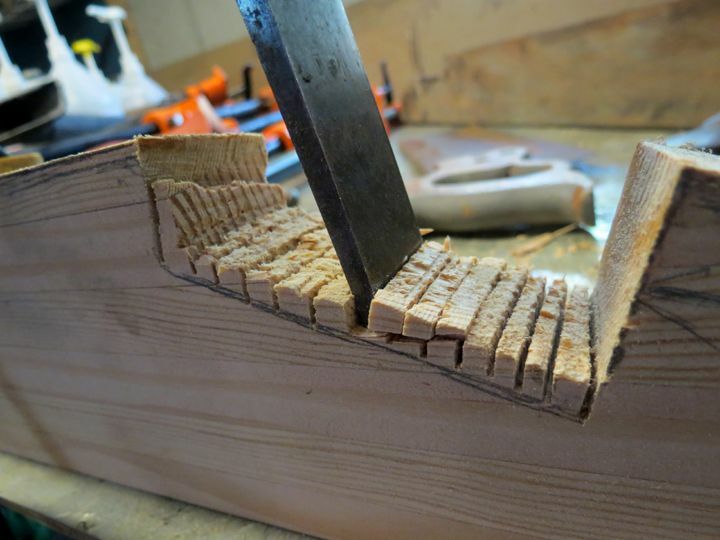 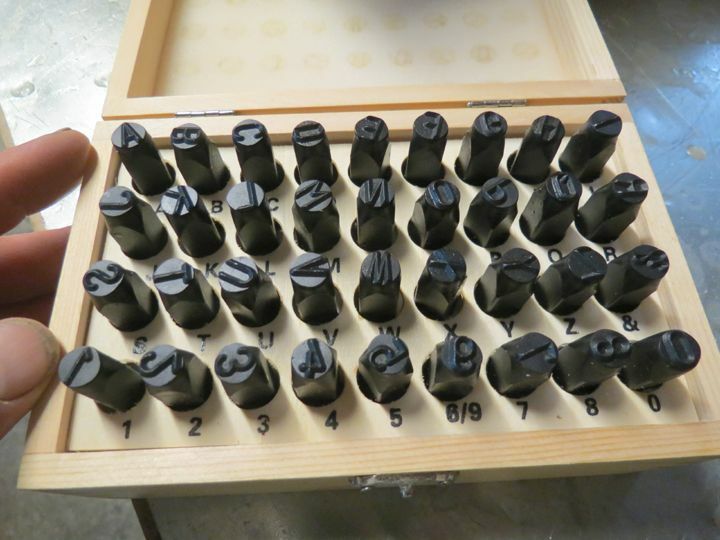 I chiseled a “kerf” around the top area of each screw. 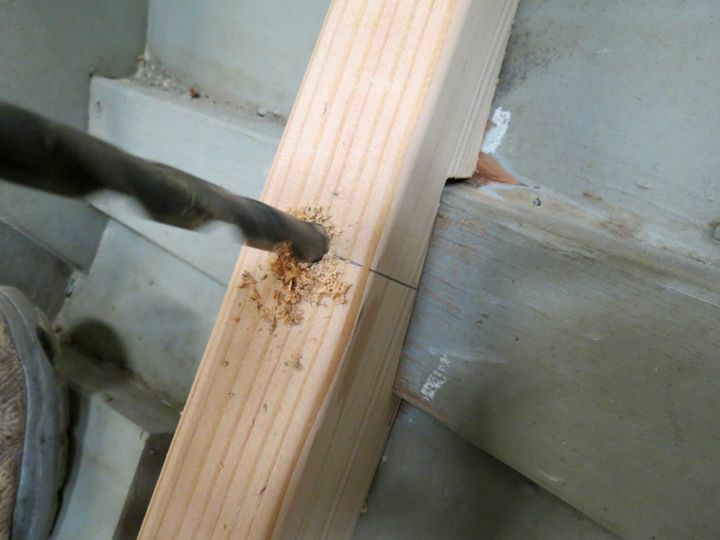 Then I cut around the screw using a holesaw with the pilot bit removed from the arbor. 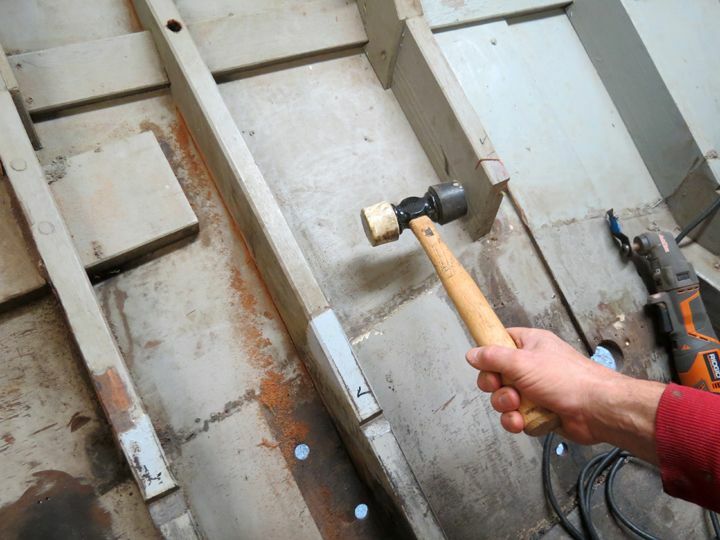 Back inside the hull, I gave the frame a couple of “thunks” with a rubber mallet and it popped out of its position. 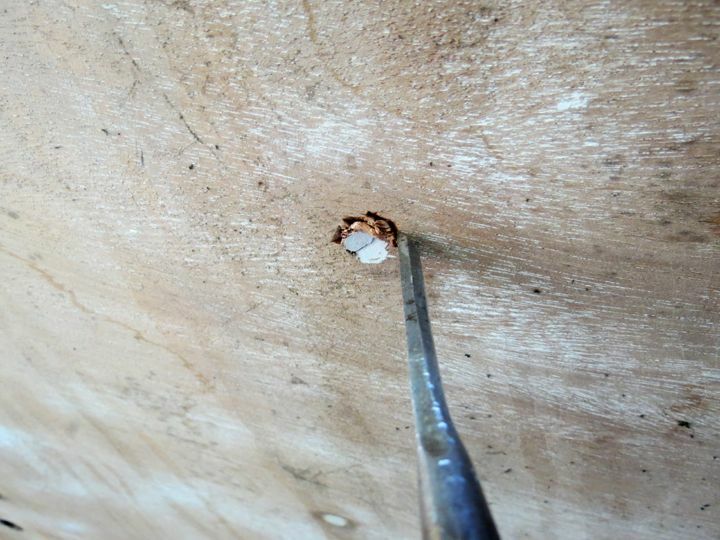 Here is an image of the fastener that was holding the foot of the frame to the keelson. 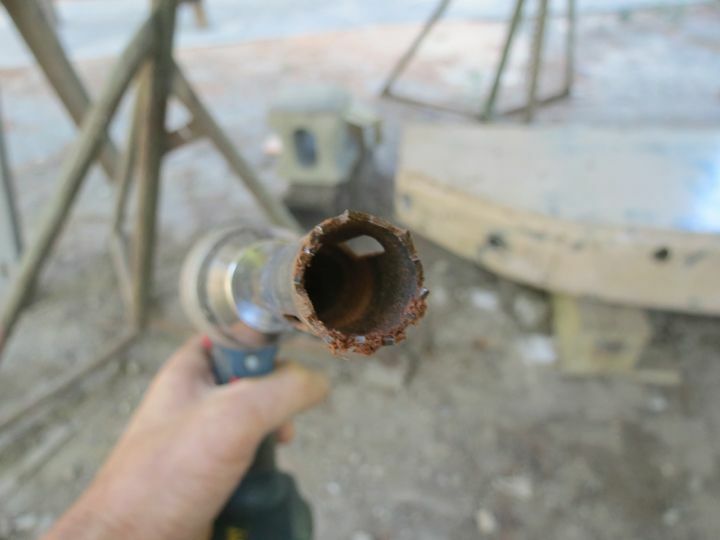 The threads are gone! 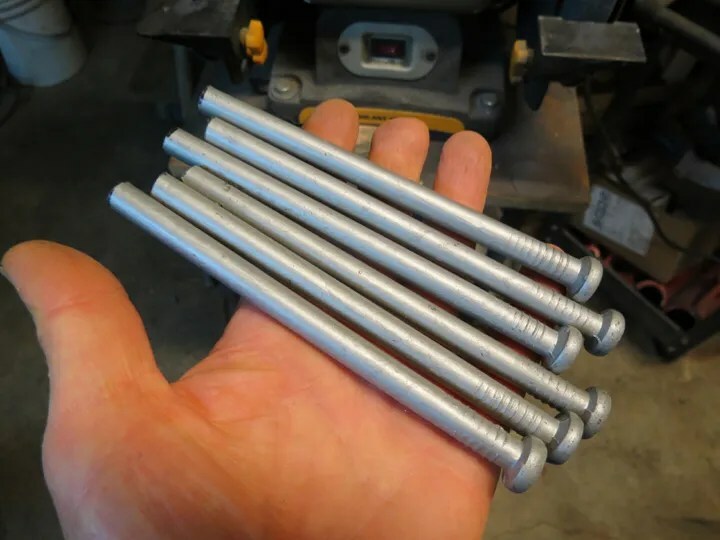 Here is another photograph that compares the fastener that was at the head of the frame and the one that was at the foot of the frame. 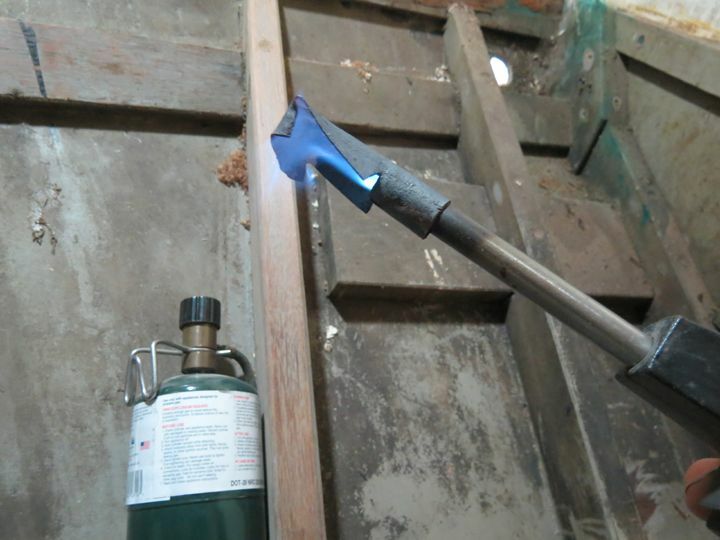 As I mentioned previously, I have been finding this to be a common trait in this boat. 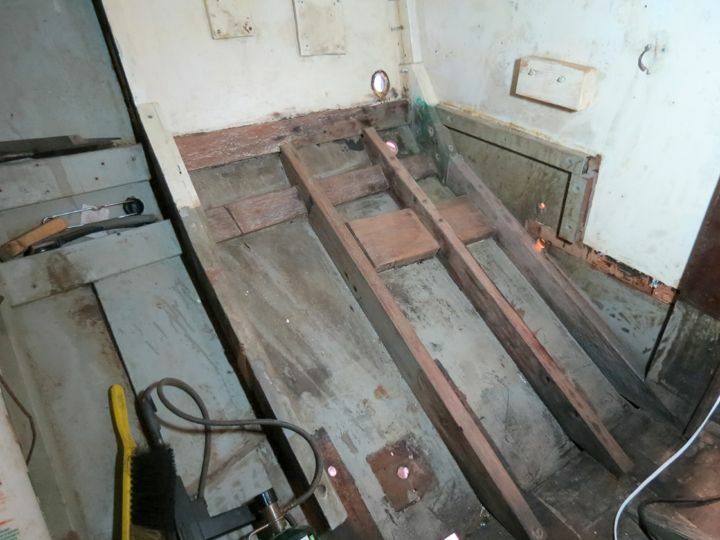 Nearly all of the fasteners that are near, or in the bilge area, are totally shot.